The national economy began the year with many challenges, but finished with strong job growth, and increasing business and consumer confidence. Throughout 2014, we remained focused on keeping our promise of providing a higher level of banking to our customers by serving as their trusted advisor and delivering an exceptional customer experience that exceeds expectations. In 2014, we also continued to make a positive difference in the communities where we live and work. All the while, we remained diligent in managing the things we can control, such as our expenses. Founded 165 years ago, the Comerica of today has the resources of a large bank and the customer-centric culture of a community bank. We have a strong presence in Texas, California and Michigan, as well as operations in Arizona and Florida. Our strategy is to have balance between our markets, which should help us achieve consistent and sustainable growth over time. We have made meaningful progress in that regard over the past 10 years. We provide comprehensive banking services through our Business Bank, Retail Bank, and Wealth Management segments. Our focus on relationships in all three segments makes a positive difference for us in this highly competitive, low-rate environment. Our 2014 net income increased 10 percent from a year ago, reflecting lower litigation-related expenses, a decrease in pension expense, and our continued drive for efficiency. We reported 2014 net income of $593 million, or $3.16 per diluted share, compared to $541 million, or $2.85 per diluted share for 2013. Excluding the impact to 2013 results of an unfavorable jury verdict in a lender liability case, which decreased 2013 net income by $28 million, or 15 cents per share, 2014 net income increased $24 million, or 4 percent, and earnings per diluted share increased 16 cents, or 5 percent. Our loan and deposit growth was solid in 2014. Average total loans increased $2.2 billion, or 5 percent, to $46.6 billion in 2014, primarily reflecting increases of $1.7 billion, or 6 percent, in commercial loans, $158 million, or 10 percent, in residential mortgage loans and $117 million, or 5 percent, in consumer loans. The increase in commercial loans was primarily driven by increases in Technology and Life Sciences, National Dealer Services, Energy and general Middle Market, partially offset by a decrease in Mortgage Banker Finance. Average total deposits increased $3.1 billion, or 6 percent, to a record $54.8 billion in 2014, reflecting increases of $2.6 billion, or 12 percent, in noninterest-bearing deposits and $433 million, or 1 percent, in interest-bearing deposits. We increased deposits in nearly all business lines and all three of our major markets, reflecting our focus on relationship banking. We had modestly lower net interest income in 2014 of $1.7 billion, a decrease of $17 million, or 1 percent, primarily as a result of a $15 million decrease in accretion of the purchase discount on our acquired loan portfolio. The benefit from an increase in loan volume was offset by continued pressure on yields from the low-rate environment and loan portfolio dynamics. Credit quality continued to be strong in 2014. As a result, the provision for credit losses decreased $19 million to $27 million in 2014, compared to 2013. Net charge-offs were $25 million, or 0.05 percent of average loans for 2014, compared to $73 million or 0.16 percent of average loans for 2013. Noninterest income decreased $14 million, or 2 percent, to $868 million in 2014. The decrease was primarily the result of a $19 million decrease in noncustomer-driven fee income categories, partially offset by a $5 million increase in customer-driven fees. We continued to carefully manage expenses in 2014. Noninterest expenses decreased $96 million, or 6 percent, to $1.6 billion, compared to 2013, primarily reflecting decreases of $48 million in litigation-related expenses and $47 million in pension expense. Comerica continued to maintain a very strong capital position. Our regulatory capital levels remain comfortably above the threshold to be considered well capitalized. On January 21, 2014, and April 22, 2014, the board of directors increased the quarterly cash dividend for common stock by 12 percent and 5 percent, respectively. We repurchased 5.2 million shares in 2014 under our share repurchase program. The dividend increases and share buyback reflect our strong capital position and solid financial performance. Through the buyback and dividends, we returned $392 million, or 66 percent, of 2014 net income to shareholders. In March 2014, the Federal Reserve did not object to our 2014 Capital Plan submission and the capital actions contemplated for the period spanning the second quarter of 2014 through the first quarter of 2015. We again participated in the Capital Plan process for 2015. * See Supplemental Financial Data section for reconcilements of non-GAAP financial measures. Along with the rest of the financial services industry, Comerica faces increased regulatory and technology demands. We incurred more than $25 million in expense in 2014 to comply with regulations. We will continue to add staff and invest in technology for regulatory-related projects such as capital planning, stress testing, enterprise risk, and the Liquidity Coverage Ratio, or LCR. Irrespective of our technology spend for compliance-related projects, technology is becoming an increasingly important element in the execution of our strategy. Customers are growing much more comfortable with online means of accessing their accounts and conducting routine banking transactions. Balanced against these growing technology demands are an expanded array of cyber-security threats across the industry that are driving increased investments in information security. Such investments enable our customers to better protect themselves and the bank to better detect sophisticated attempts to penetrate our defenses. At the same time, we see our investments in technology as helping to improve data quality, deepen insights into customer demands, and provide for greater overall efficiency. With respect to LCR, the final rule was issued in September 2014. The LCR was included as part of the Basel Accords to help ensure that banks can withstand short-term liquidity disruptions. Banks of our size will need to phase in compliance beginning in 2016 and be subject to a monthly calculation. We continue to feel comfortable that we will meet the proposed phase-in threshold within the required time frame, which for us is 90 percent by January 2016 and 100 percent by January 2017. Our diverse footprint covers seven of the largest 10 cities in the country, as well as many just outside the top 10. We find customers are attracted to Comerica because we get to know and understand them. Our relationship banking model does make a positive difference for us and remains a competitive advantage. Texas and California are the two largest economies in the United States. We have had a presence in these high-growth markets for more than a quarter century. Within Texas, we continue to leverage our standing as the largest U.S. commercial bank headquartered in the state, a source of pride for us and our customers. We strengthened our Middle Market Banking team across Texas in 2014 with the addition of bankers in Houston, Dallas and, most recently, Austin. Texas is home to our Energy business, which is focused on well-established middle market companies. We have extensive knowledge of the energy industry, with a long history of managing a solid portfolio that has performed exceptionally well through a number of cycles. Our Energy business strategy is built to withstand the kind of energy sector volatility that we saw late in 2014. Average loans and deposits in Texas in 2014 were up 10 percent and 5 percent, respectively, compared to a year ago. California is home to our Technology and Life Sciences business, Entertainment group, and Financial Services Division, which is our title and escrow business. Our expertise in these businesses and others help differentiate us from the competition in California. California also is the largest market for our National Dealer Services business – another industry in which we have accumulated years of experience. Average loans and deposits in California in 2014 were both up 10 percent compared to a year ago. Michigan is an important market to us and is where we began operations in 1849. We have maintained our No. 2 deposit market share in the state, based on the latest FDIC data. We continue to benefit from our reputation as a steady, reliable main street bank, committed to the region. We were proud to support the City of Detroit through our $1 million commitment to the “grand bargain,” which helped the city successfully emerge from bankruptcy, while supporting city pensioners and protecting the great works at the Detroit Institute of Arts. Average loans in Michigan were relatively stable in 2014 compared to a year ago, and average deposits increased 3 percent. Together with our diverse footprint, growth is driven by our three strategic lines of business. Within the Business Bank, our clear strengths are our relationship model and approach to commercial banking. We are not just “lenders,” as we strive to be strategic partners with our customers. Through our relationship banker model, we have a singular point of contact who not only understands our customers’ strategic initiatives, but is a conduit to key specialists who customize solutions that will support our customers in attaining their goals. Our tenured and experienced Business Bank colleagues provide for a consistent delivery of the promise we make to raise the expectations of what a bank can be. With a strong foundation provided by our active credit training and mentoring programs, and the long tenure of our Business Bank managers, who average almost 20 years of experience, we are proudly delivering value to our customers. Nationally, we provide a broad spectrum of specialized business lines, such as National Dealer Services, Mortgage Banker Finance, and Technology and Life Sciences. We opened a new Technology and Life Sciences office in New York in 2014. With that addition, we now have a physical presence in nine of the top 10 markets for new venture capital investments in the United States. In 2014, the Business Bank focused on achieving profitable growth through the addition of new and expanded customer relationships, and selectively reallocating resources to those markets and business lines that provide the greatest opportunities for us. All the while, the Business Bank maintained pricing discipline in an increasingly competitive environment by focusing on our value proposition and by acting as a strategic partner with our customers. Piloted in our Middle Market groups with almost immediate success, our High Performance Planning and Execution initiative provides analytical data that leads to specific action plans geared at improving the overall financial performance of our portfolio. Trusted Advisor is a Comerica developed and led program that provides our relationship bankers and other customer-facing colleagues in the Business Bank with the tools they need to build mutually beneficial relationships through quality customer experiences and tailored financial solutions. The program focuses our business bankers on identifying solutions that help our customers to manage their growth, cash, risk and wealth. Technology and integration played important roles within the Treasury Management Services area of the Business Bank in 2014. We introduced a suite of new integrated solutions to help our customers be more successful in managing their payables, receivables and cash flow. These new solutions – Integrated Payables Web, Integrated Receivables and Integrated Cash Position Manager – certainly leverage the latest technology, but the true value these solutions provide can only be achieved if they are designed with the customer in mind. That’s why we formed the Treasury Management Strategic Advisory Council in 2014. The Council’s membership includes Treasury Management customers in all markets who give us their feedback, ideas and insights to improve the services we provide. In its first year of operation, the Council has proven to be one of the most critical inputs to our product road map and our design of commercial mobile solutions. Commercial cards continue to gain traction and are a key component of our Treasury Management Services integrated payables offering as customers seek efficient, paperless solutions to meet their cash management needs. Comerica was ranked as the 10th largest U.S. Visa and MasterCard commercial card issuer in 2013, according to the August 2014 edition of The Nilson Report. In particular, Comerica was ranked as the largest issuer of prepaid commercial cards and fifth largest issuer of fleet cards. Comerica is proud to serve as the U.S. Department of the Treasury’s exclusive financial agent for the Direct Express® Debit MasterCard®, a prepaid debit card and electronic payment option for federal benefits, which provides a convenient alternative to paper checks. Since the U.S. Department of the Treasury began surveying cardholders in 2009, the Direct Express® program has maintained very high customer satisfaction ratings of 94 percent or above. This program provides monthly benefits payments via safe, reliable channels for individuals who typically do not have traditional bank accounts. In September 2014, the U.S. Department of the Treasury announced it has retained Comerica as the exclusive financial agent for the Direct Express® program for another five years, through 2020. In 2014, we also announced our agreement with Vantiv, Inc., to provide payment processing solutions for our Merchant Services customers. Comerica’s Merchant Services enable businesses to enjoy the convenience of accepting card payments utilizing the latest in technology, including advanced security products and reporting tools. While at year-end 2014 we were just getting started with Vantiv, our pipeline, closed sales and activations were all exceeding expectations. As we enter 2015, the Business Bank is focused on sustaining its momentum by building upon its successful 2014 initiatives and supporting our continued growth and success in an increasingly regulated, competitive, and dynamic environment. The Retail Bank and Wealth Management segments are key parts of our strategy of growth and balance. Through strong collaboration with colleagues in other business units, we bring a broad spectrum of products and services to customers and prospects in each of our primary markets. Our Retail Bank and Wealth Management segments provide us a stable, low-cost source of funding through core deposit generation, which has gained even more importance since the announcement of the Basel III LCR requirements. Like the bank as a whole, the Retail Bank and Wealth Management segments are focused on operating efficiencies that go beyond cutting expenses. This includes streamlining procedures, rethinking the way we have done business in the past, and investing in technology to provide even more convenience to our customers. For example, we invested in technology that enabled us to offer a number of enhancements to our consumer mobile banking service in 2014, including alerts, Click&Capture Deposit, person-to-person transfers, and a new, enhanced iPad application. Technology is also at the forefront in the evolution now underway in branch banking. It really is no longer a one-size-fits-all strategy. The evolution is driven, in part, by the speed at which new technologies and capabilities are being embraced by the consumer. That is why we are excited about piloting our experienceCenter. Designed to be experimental, the experienceCenter is a true test-and-learn environment that allows us to vet new technologies, delivery channels and services in real time. It also offers us a way to identify and measure technologies best suited to serve our clients and colleagues. This helps ensure wise spending as only the most successful concepts go into production. The first such pilot opened in 2014 at a banking center in Auburn Hills, Michigan. Our banking network remains strategically aligned within the key urban areas of our primary markets. We believe our network is well situated. We regularly review it to ensure we have optimal coverage to meet customer needs. We plan to add banking centers as the right opportunities arise and as the economy continues to improve. Small Business is an important part of our Retail Bank, just as small businesses are important to the growth of our national economy. We were pleased to introduce our Small Business Resource Center in 2014. The Center is a web-based informational space that brings a wealth of tools and resources for business owners and leaders right to their fingertips. The materials and interactive components are practical, easy to use and assist our customers in taking the right steps to grow and manage their businesses. Look for more information at comerica.com/ResourceCenter. Additionally, in 2014 we expanded our small business healthcare profession group to Michigan, to go along with the group’s presence in Texas and Arizona. The group applies our specialty lending expertise to a high-growth segment focused on doctors, dentists, group practices, surgery centers, medical office buildings and other healthcare entities. Comerica, through the Retail Bank, was selected to serve as the financial agent for the U.S. Department of Treasury’s myRA program. The myRA program is a retirement savings program targeting low- to moderate-income Americans who do not have access to employer-sponsored retirement savings plans. Wealth Management provides us the ability to bring private banking, investment management, and fiduciary solutions to our Business Bank and Retail Bank customers. Our target customers include business owners, corporate executives, first generation wealth, foundations and institutions. A key strength of Comerica is working with business owners to address the needs of their businesses, as well as their personal wealth goals. Our Business Owner Advisory Services group within Wealth Management, partnering with the Business Bank, has had impressive results, bringing in some $1 billion in new balances in 2014, and nearly $2 billion since its inception in 2012. Also within Wealth Management is our Professional Trust Alliance, which we established almost 20 years ago. We have agreements with third-party broker-dealers to provide trust administration and investment monitoring for their clients. We continue to build this business and currently have agreements with 13 broker-dealers. This business has become a significant contributor to increasing our fiduciary income. We have grown the assets under management related to these alliances considerably over the past two years. At present, we have 14 offices throughout the United States dedicated to serving and building our Professional Trust Alliance business. Our Corporate Marketing area continues to facilitate the adoption of the Comerica Promise in partnership across all of our business lines. The new “Promise” branding can be seen in many of our printed materials, including this annual report, as well as in our advertising. At the heart of the Comerica Promise, which is aimed at raising expectations of what a bank can be, are our core values of Customer-centricity, Collaboration, Integrity, Excellence, Agility, Diversity, and Involvement. The response to the Promise campaign from customers and colleagues has been positive and enthusiastic. Comerica continues to be recognized for its commitment to sustainability. In 2014, we were listed for a second consecutive year on the CDP Carbon Performance Leadership Index and were one of the top-ranked U.S. banks in the Newsweek Green Rankings. Comerica also received a Green Supply Chain award from the Supply & Demand Chain Executive Magazine, was the only U.S. bank listed as a Greenbiz Natural Capital Efficiency Leader, and continued its listing on the FTSE4Good and Thomson Reuters Corporate Responsibility indices. One initiative that showcased our core value of Involvement in 2014 was our community shred days, where Comerica helped individuals and businesses discard documents safely and sustainably. The secure shredding of these documents supported our commitments to reduce the potential for identity theft from improper disposal of sensitive documents and to safely recycle the waste paper. Comerica’s commitment to the community also can be seen in our charitable contributions, and employee giving and volunteerism. In 2014, Comerica contributed more than $8.5 million to nonprofit organizations within our markets. Our employees raised some $2.2 million for the United Way and Black United Fund. In addition, our employees donated their personal time and talents – more than 73,000 hours, far exceeding our goal – back to the communities where they live and work, including on our National Days of Service, when some 54 projects were held. In Dallas, we formed a partnership in 2014 with Dallas Children’s Advocacy Center (DCAC) to help the nonprofit provide backpacks, school supplies, uniforms and personal effects to children who might have otherwise started the school year without these essentials. In our first year of sponsoring the social media-driven effort, we helped the nonprofit raise more than $40,000 and provide more than 900 backpacks to DCAC clients and their siblings. Helping to provide school supplies for low- to moderate-income students has been a priority in a number of our markets for several years. In California, we participated in backpack drives in the Bay Area, Los Angeles and San Diego. Comerica continues to sponsor the Comerica Hatch Detroit Contest, which seeks ideas for new retail businesses in Detroit. In 2014, Comerica again provided the grand prize award. A similar contest was held for the first time in North Texas with the Dallas Entrepreneur Center, with positive results. We awarded a grant in Michigan to the City of Ferndale Police Department, winner of the grand prize in our Home of the Brave National Anthem Facebook Contest. Ferndale Detective Brendan Moore won the grant for his department and the opportunity to sing the National Anthem at Comerica Park, home of the Detroit Tigers. At Comerica, we celebrate the differences among our colleagues and customers, with the understanding that such differences make us a stronger company. That is why we are so grateful and honored to receive recognition in 2014 for our focus on diversity. For example, Comerica was once again ranked among the top five in the DiversityInc “Top 10 Regional Companies for Diversity.” LATINA Style Magazine recognized our bank, once again, as being among the “50 Best Companies for Latinas to Work for in the U.S.” Digital media company DailyWorth recognized Comerica for being among the “25 Best Companies to Work for if You are a Woman.” And, Comerica earned a perfect rating of 100 percent on the Human Rights Campaign 2014 Corporate Equality Index, a national benchmarking survey and report on corporate policies and practices related to LGBT workplace equality. Among other notable recognition received in 2014, Comerica ranked fifth among customers and fourth among noncustomers in the American Banker/Reputation Institute survey of bank reputations. We certainly appreciate all of the positive recognition. Looking ahead, we believe we are well positioned for 2015 and beyond. We remain focused on the long term and the things we can control, such as growing loans and deposits along with managing our expenses. We are in the right markets with the right products and services, and with the right people, who remain focused on building enduring customer relationships. We plan to stay with our relationship banking strategy, which has served us well through many cycles. This is not the time to reach, so we plan to maintain our pricing and credit discipline. We will continue to manage through the headwinds arising from the continuing low-rate environment, declining purchase accounting accretion, and increasing regulatory and technology demands. We expect that as the economy continues to improve and the potential for a rate-rise nears, our revenue picture looks brighter. In short, our conservative, consistent approach to banking – which includes credit management, investment strategy, capital position, and focus on building relationships – has positioned us well for the future. We remain committed to providing attractive long-term returns for you, our shareholders. These securities are registered on the New York Stock Exchange. At June 30, 2014 (the last business day of the registrant’s most recently completed second fiscal quarter), the registrant’s common stock, $5 par value, held by non-affiliates had an aggregate market value of approximately $8.9 billion based on the closing price on the New York Stock Exchange on that date of $50.16 per share. For purposes of this Form 10-K only, it has been assumed that all common shares Comerica’s Trust Department holds for Comerica’s employee plans, and all common shares the registrant’s directors and executive officers hold, are shares held by affiliates. At February 11, 2015, the registrant had outstanding 178,359,394 shares of its common stock, $5 par value. Items 10-14—Proxy Statement for the Annual Meeting of Shareholders to be held April 28, 2015. Comerica Incorporated (“Comerica”) is a financial services company, incorporated under the laws of the State of Delaware, and headquartered in Dallas, Texas. Based on total assets as reported in the most recently filed Consolidated Financial Statements for Bank Holding Companies (FR Y-9C), it was among the 25 largest commercial United States (“U.S.”) financial holding companies. Comerica was formed in 1973 to acquire the outstanding common stock of Comerica Bank, which at such time was a Michigan banking corporation and one of Michigan's oldest banks (formerly Comerica Bank-Detroit). On October 31, 2007, Comerica Bank, a Michigan banking corporation, was merged with and into Comerica Bank, a Texas banking association (“Comerica Bank”). As of December 31, 2014, Comerica owned directly or indirectly all the outstanding common stock of 2 active banking and 40 non-banking subsidiaries. At December 31, 2014, Comerica had total assets of approximately $69.2 billion, total deposits of approximately $57.5 billion, total loans (net of unearned income) of approximately $48.6 billion and shareholders’ equity of approximately $7.4 billion. Comerica has strategically aligned its operations into three major business segments: the Business Bank, the Retail Bank, and Wealth Management. In addition to the three major business segments, Finance is also reported as a segment. We provide information about our business segments in Note 22 on pages F-101 through F-105 of the Notes to Consolidated Financial Statements located in the Financial Section of this report. Comerica operates in three primary geographic markets - Texas, California, and Michigan, as well as in Arizona and Florida, with select businesses operating in several other states, and in Canada and Mexico. We provide information about our market segments in Note 22 on pages F-101 through F-105 of the Notes to Consolidated Financial Statements located in the Financial Section of this report. Activities with customers domiciled outside the U.S., in total or with any individual country, are not significant. We provide information on risks attendant to foreign operations: (1) under the caption “Concentration of Credit Risk” on pages F-26 through F-27 of the Financial Section of this report; and (2) under the caption "International Exposure" on page F-29 of the Financial Section of this report. We provide information about the net interest income and noninterest income we received from our various classes of products and services: (1) under the caption, “Analysis of Net Interest Income-Fully Taxable Equivalent (FTE)” on page F-6 of the Financial Section of this report; (2) under the caption “Net Interest Income” on pages F-7 through F-8 of the Financial Section of this report; and (3) under the caption “Noninterest Income” on pages F-8 through F-9 of the Financial Section of this report. Acquisition of Sterling Bancshares, Inc.
On July 28, 2011, Comerica acquired all the outstanding common stock of Sterling Bancshares, Inc. ("Sterling"), a bank holding company headquartered in Houston, Texas, in a stock-for-stock transaction. Sterling common shareholders and holders of outstanding Sterling phantom stock units received 0.2365 shares of Comerica's common stock in exchange for each share of Sterling common stock or phantom stock unit. As a result, Comerica issued approximately 24 million common shares with an acquisition date fair value of $793 million, based on Comerica's closing stock price of $32.67 on July 27, 2011. Based on the merger agreement, outstanding and unexercised options to purchase Sterling common stock were converted into fully vested options to purchase common stock of Comerica. In addition, outstanding warrants to purchase Sterling common stock were converted into warrants to purchase common stock of Comerica. Including an insignificant amount of cash paid in lieu of fractional shares, the fair value of total consideration paid was $803 million. The acquisition of Sterling significantly expanded Comerica's presence in Texas, particularly in the Houston and San Antonio areas. The financial services business is highly competitive. Comerica and its subsidiaries mainly compete in their three primary geographic markets of Texas, California and Michigan, as well as in the states of Arizona and Florida. They also compete in broader, national geographic markets, as well as markets in Mexico and Canada. They are subject to competition with respect to various products and services, including, without limitation, loans and lines of credit, deposits, cash management, capital market products, international trade finance, letters of credit, foreign exchange management services, loan syndication services, consumer lending, consumer deposit gathering and mortgage loan origination, consumer products, fiduciary services, private banking, retirement services, investment management and advisory services, investment banking services, brokerage services, the sale of annuity products, and the sale of life, disability and long-term care insurance products. presence in Comerica's market area, may make available to their customers a broader array of product, pricing and structure alternatives and, due to their asset size, may more easily absorb loans in a larger overall portfolio. Some of Comerica's smaller competitors may have more liberal lending policies and processes. Further, Comerica's banking competitors may be subject to a significantly different or reduced degree of regulation due to their asset size or types of products offered. They may also have the ability to more efficiently utilize resources to comply with regulations or may be able to more effectively absorb the costs of regulations into their existing cost structure. Comerica believes that the level of competition in all geographic markets will continue to increase in the future. In addition to banks, Comerica's banking subsidiaries also face competition from other financial intermediaries, including savings and loan associations, consumer finance companies, leasing companies, venture capital funds, credit unions, investment banks, insurance companies and securities firms. Competition among providers of financial products and services continues to increase, with consumers having the opportunity to select from a growing variety of traditional and nontraditional alternatives. The ability of non-banking financial institutions to provide services previously limited to commercial banks has intensified competition. Because non-banking financial institutions are not subject to many of the same regulatory restrictions as banks and bank holding companies, they can often operate with greater flexibility and lower cost structures. In addition, the industry continues to consolidate, which affects competition by eliminating some regional and local institutions, while strengthening the franchises of acquirers. Banks, bank holding companies, and financial institutions are highly regulated at both the state and federal level. Comerica is subject to supervision and regulation at the federal level by the Board of Governors of the Federal Reserve System (“FRB”) under the Bank Holding Company Act of 1956, as amended. The Gramm-Leach-Bliley Act expanded the activities in which a bank holding company registered as a financial holding company can engage. The conditions to be a financial holding company include, among others, the requirement that each depository institution subsidiary of the holding company be well capitalized and well managed. Effective July 2011, the Dodd-Frank Wall Street Reform and Consumer Protection Act (the “Dodd-Frank Act”) also requires the well capitalized and well managed standards to be met at the financial holding company level. Comerica became a financial holding company in 2000. As a financial holding company, Comerica may affiliate with securities firms and insurance companies, and engage in activities that are financial in nature. Activities that are “financial in nature” include, but are not limited to: securities underwriting; securities dealing and market making; sponsoring mutual funds and investment companies (subject to regulatory requirements, including restrictions set forth in the Volcker Rule, described under the heading "The Dodd-Frank Wall Street Reform and Consumer Protection Act and Other Recent Legislative and Regulatory Developments" below); insurance underwriting and agency; merchant banking; and activities that the FRB has determined to be financial in nature or incidental or complementary to a financial activity, provided that it does not pose a substantial risk to the safety or soundness of the depository institution or the financial system generally. A bank holding company that is not also a financial holding company is limited to engaging in banking and other activities previously determined by the FRB to be closely related to banking. Comerica Bank is chartered by the State of Texas and at the state level is supervised and regulated by the Texas Department of Banking under the Texas Finance Code. Comerica Bank has elected to be a member of the Federal Reserve System under the Federal Reserve Act and, consequently, is supervised and regulated by the Federal Reserve Bank of Dallas. Comerica Bank & Trust, National Association is chartered under federal law and is subject to supervision and regulation by the Office of the Comptroller of the Currency (“OCC”) under the National Bank Act. Comerica Bank & Trust, National Association, by virtue of being a national bank, is also a member of the Federal Reserve System. The deposits of Comerica Bank and Comerica Bank & Trust, National Association are insured by the Deposit Insurance Fund of the Federal Deposit Insurance Corporation (“FDIC”) to the extent provided by law. In Canada, Comerica Bank is supervised by the Office of the Superintendent of Financial Institutions. The FRB supervises non-banking activities conducted by companies directly and indirectly owned by Comerica. In addition, Comerica's non-banking subsidiaries are subject to supervision and regulation by various state, federal and self-regulatory agencies, including, but not limited to, the Financial Industry Regulatory Authority (in the case of Comerica Securities, Inc.), the Office of Financial and Insurance Regulation of the State of Michigan (in the case of Comerica Securities, Inc. and Comerica Insurance Services, Inc.), and the Securities and Exchange Commission (“SEC”) (in the case of Comerica Securities, Inc., World Asset Management, Inc. and Wilson, Kemp & Associates, Inc.). Described below are material elements of selected laws and regulations applicable to Comerica and its subsidiaries. The descriptions are not intended to be complete and are qualified in their entirety by reference to the full text of the statutes and regulations described. Changes in applicable law or regulation, and in their application by regulatory agencies, cannot be predicted, but they may have a material effect on the business of Comerica and its subsidiaries. In most cases, no FRB approval is required for Comerica to acquire a company engaged in activities that are financial in nature or incidental to activities that are financial in nature, as determined by the FRB. However, Federal and state laws impose notice and approval requirements for mergers and acquisitions of other depository institutions or bank holding companies. Prior approval is required before Comerica may acquire the beneficial ownership or control of more than 5% of the voting shares or substantially all of the assets of a bank holding company (including a financial holding company) or a bank. The Community Reinvestment Act of 1977 (“CRA”) requires U.S. banks to help serve the credit needs of their communities. Comerica Bank's current rating under the “CRA” is “satisfactory”. If any subsidiary bank of Comerica were to receive a rating under the CRA of less than “satisfactory,” Comerica would be prohibited from engaging in certain activities. In addition, Comerica, Comerica Bank and Comerica Bank & Trust, National Association, are each “well capitalized” and “well managed” under FRB standards. If any subsidiary bank of Comerica were to cease being “well capitalized” or “well managed” under applicable regulatory standards, the FRB could place limitations on Comerica's ability to conduct the broader financial activities permissible for financial holding companies or impose limitations or conditions on the conduct or activities of Comerica or its affiliates. If the deficiencies persisted, the FRB could order Comerica to divest any subsidiary bank or to cease engaging in any activities permissible for financial holding companies that are not permissible for bank holding companies, or Comerica could elect to conform its non-banking activities to those permissible for a bank holding company that is not also a financial holding company. Further, the effectiveness of Comerica and its subsidiaries in complying with anti-money laundering regulations (discussed below) is also taken into account by the FRB when considering applications for approval of acquisitions. Various governmental requirements, including Sections 23A and 23B of the Federal Reserve Act and the FRB's Regulation W, limit borrowings by Comerica and its nonbank subsidiaries from its affiliate insured depository institutions, and also limit various other transactions between Comerica and its nonbank subsidiaries, on the one hand, and Comerica's affiliate insured depository institutions, on the other. For example, Section 23A of the Federal Reserve Act limits the aggregate outstanding amount of any insured depository institution's loans and other “covered transactions” with any particular nonbank affiliate to no more than 10% of the institution's total capital and limits the aggregate outstanding amount of any insured depository institution's covered transactions with all of its nonbank affiliates to no more than 20% of its total capital. “Covered transactions” are defined by statute to include a loan or extension of credit, as well as a purchase of securities issued by an affiliate, a purchase of assets (unless otherwise exempted by the FRB) from the affiliate, the acceptance of securities issued by the affiliate as collateral for a loan, and the issuance of a guarantee, acceptance or letter of credit on behalf of an affiliate. Section 23A of the Federal Reserve Act also generally requires that an insured depository institution's loans to its nonbank affiliates be, at a minimum, 100% secured, and Section 23B of the Federal Reserve Act generally requires that an insured depository institution's transactions with its nonbank affiliates be on terms and under circumstances that are substantially the same or at least as favorable as those prevailing for comparable transactions with nonaffiliates. The Dodd-Frank Act significantly expanded the coverage and scope of the limitations on affiliate transactions within a banking organization. For example, commencing in July 2012, the Dodd-Frank Act applies the 10% of capital limit on covered transactions to financial subsidiaries and amends the definition of “covered transaction” to include (i) securities borrowing or lending transactions with an affiliate, and (ii) all derivatives transactions with an affiliate, to the extent that either causes a bank or its affiliate to have credit exposure to the securities borrowing/lending or derivative counterparty. The privacy provisions of the Gramm-Leach-Bliley Act generally prohibit financial institutions, including Comerica, from disclosing nonpublic personal financial information of consumer customers to third parties for certain purposes (primarily marketing) unless customers have the opportunity to “opt out” of the disclosure. The Fair Credit Reporting Act restricts information sharing among affiliates for marketing purposes. The Uniting and Strengthening America by Providing Appropriate Tools Required to Intercept and Obstruct Terrorism Act (“USA PATRIOT Act”) of 2001 and its implementing regulations substantially broadened the scope of U.S. anti-money laundering laws and regulations by requiring insured depository institutions, broker-dealers, and certain other financial institutions to have policies, procedures, and controls to detect, prevent, and report money laundering and terrorist financing. The USA PATRIOT Act and its regulations also provide for information sharing, subject to conditions, between federal law enforcement agencies and financial institutions, as well as among financial institutions, for counter-terrorism purposes. Federal banking regulators are required, when reviewing bank holding company acquisition and bank merger applications, to take into account the effectiveness of the anti-money laundering activities of the applicants. To comply with these obligations, Comerica and its various operating units have implemented appropriate internal practices, procedures, and controls. The Interstate Banking and Branching Efficiency Act (the “Interstate Act”), as amended by the Dodd-Frank Act, permits a bank holding company, with FRB approval, to acquire banking institutions located in states other than the bank holding company's home state without regard to whether the transaction is prohibited under state law, but subject to any state requirement that the bank has been organized and operating for a minimum period of time, not to exceed five years, and the requirement that the bank holding company, prior to and following the proposed acquisition, control no more than 10% of the total amount of deposits of insured depository institutions in the U.S. and no more than 30% of such deposits in that state (or such amount as established by state law if such amount is lower than 30%). The Interstate Act, as amended, also authorizes banks to operate branch offices outside their home states by merging with out-of-state banks, purchasing branches in other states and by establishing de novo branches in other states, subject to various conditions. In the case of purchasing branches in a state in which it does not already have banking operations, the “host” state must have “opted-in” to the Interstate Act by enacting a law permitting such branch purchases. The Dodd-Frank Act expanded the de novo interstate branching authority of banks beyond what had been permitted under the Interstate Act by eliminating the requirement that a state expressly “opt-in” to de novo branching, in favor of a rule that de novo interstate branching is permissible if under the law of the state in which the branch is to be located, a state bank chartered by that state would be permitted to establish the branch. Effective July 21, 2011, the Dodd-Frank Act also required that a bank holding company or bank be well capitalized and well managed (rather than simply adequately capitalized and adequately managed) in order to take advantage of these interstate banking and branching provisions. Comerica has consolidated most of its banking business into one bank, Comerica Bank, with branches in Texas, Arizona, California, Florida and Michigan. Comerica is a legal entity separate and distinct from its banking and other subsidiaries. Most of Comerica's revenues result from dividends its bank subsidiaries pay it. There are statutory and regulatory requirements applicable to the payment of dividends by subsidiary banks to Comerica, as well as by Comerica to its shareholders. Certain, but not all, of these requirements are discussed below. Comerica Bank and Comerica Bank & Trust, National Association are required by federal law to obtain the prior approval of the FRB and/or the OCC, as the case may be, for the declaration and payment of dividends, if the total of all dividends declared by the board of directors of such bank in any calendar year will exceed the total of (i) such bank's retained net income (as defined and interpreted by regulation) for that year plus (ii) the retained net income (as defined and interpreted by regulation) for the preceding two years, less any required transfers to surplus or to fund the retirement of preferred stock. At January 1, 2015, Comerica's subsidiary banks could declare aggregate dividends of approximately $375 million from retained net profits of the preceding two years. Comerica's subsidiary banks declared dividends of $380 million in 2014, $480 million in 2013 and $497 million in 2012. Further, federal regulatory agencies can prohibit a banking institution or bank holding company from engaging in unsafe and unsound banking practices and could prohibit the payment of dividends under circumstances in which such payment could be deemed an unsafe and unsound banking practice. Under the Federal Deposit Insurance Corporation Improvement Act (“FDICIA”), “prompt corrective action” regime discussed below, which applies to each of Comerica Bank and Comerica Bank & Trust, National Association, a subject bank is specifically prohibited from paying dividends to its parent company if payment would result in the bank becoming “undercapitalized.” In addition, Comerica Bank is also subject to limitations under Texas state law regarding the amount of earnings that may be paid out as dividends to its parent company, and requiring prior approval for payments of dividends that exceed certain levels. Additionally, the payment of dividends by Comerica to its shareholders is subject to the non-objection of the FRB pursuant to the Comprehensive Capital Analysis and Review (CCAR) program. For more information, please see “The Dodd-Frank Wall Street Reform and Consumer Protection Act and Other Recent Legislative and Regulatory Developments” in this section. Federal law and FRB regulations require that bank holding companies serve as a source of strength to each subsidiary bank and commit resources to support each subsidiary bank. This support may be required at times when a bank holding company may not be able to provide such support without adversely affecting its ability to meet other obligations. Similarly, under the cross-guarantee provisions of the Federal Deposit Insurance Act, in the event of a loss suffered or anticipated by the FDIC (either as a result of the failure of a banking subsidiary or related to FDIC assistance provided to such a subsidiary in danger of failure), the other banking subsidiaries may be assessed for the FDIC's loss, subject to certain exceptions. institution's capital tier will depend upon where its capital levels are in relation to various relevant capital measures, which, among others, include a Tier 1 and total risk-based capital measure and a leverage ratio capital measure. Regulations establishing the specific capital tiers provide that, for a depository institution to be well capitalized, it must have a total risk-based capital ratio of at least 10% and a Tier 1 risk-based capital ratio of at least 6%, a Tier 1 leverage ratio of at least 5% and not be subject to any specific capital order or directive. For an institution to be adequately capitalized, it must have a total risk-based capital ratio of at least 8%, a Tier 1 risk-based capital ratio of at least 4%, and a Tier 1 leverage ratio of at least 4% (and in some cases 3%). Under certain circumstances, the appropriate banking agency may treat a well capitalized, adequately capitalized or undercapitalized institution as if the institution were in the next lower capital category. As of December 31, 2014, Comerica and its banking subsidiaries exceeded the ratios required for an institution to be considered “well capitalized” under these regulations. FDICIA generally prohibits a depository institution from making any capital distribution (including payment of a dividend) or paying any management fee to its holding company if the depository institution would thereafter be undercapitalized. Undercapitalized depository institutions are subject to limitations on growth and certain activities and are required to submit an acceptable capital restoration plan. The federal banking agencies may not accept a capital plan without determining, among other things, that the plan is based on realistic assumptions and is likely to succeed in restoring the depository institution's capital. In addition, for a capital restoration plan to be acceptable, the institution's parent holding company must guarantee for a specific time period that the institution will comply with such capital restoration plan. The aggregate liability of the parent holding company under the guaranty is limited to the lesser of (i) an amount equal to 5% of the depository institution's total assets at the time it became undercapitalized, or (ii) the amount that is necessary (or would have been necessary) to bring the institution into compliance with all capital standards applicable with respect to such institution as of the time it fails to comply with the plan. If a depository institution fails to submit or implement an acceptable plan, it is treated as if it is significantly undercapitalized. Significantly undercapitalized depository institutions are subject to a number of requirements and restrictions. Specifically, such a depository institution may be required to do one or more of the following, among other things: sell sufficient voting stock to become adequately capitalized, reduce the interest rates it pays on deposits, reduce its rate of asset growth, dismiss certain senior executive officers or directors, or stop accepting deposits from correspondent banks. Critically undercapitalized institutions are subject to the appointment of a receiver or conservator or such other action as the FDIC and the applicable federal banking agency shall determine appropriate. As an additional means to identify problems in the financial management of depository institutions, FDICIA requires federal bank regulatory agencies to establish certain non-capital safety and soundness standards for institutions any such agency supervises. The standards relate generally to, among others, earnings, liquidity, operations and management, asset quality, various risk and management exposures (e.g., credit, operational, market, interest rate, etc.) and executive compensation. The agencies are authorized to take action against institutions that fail to meet such standards. FDICIA also contains a variety of other provisions that may affect the operations of depository institutions including reporting requirements, regulatory standards for real estate lending, “truth in savings” provisions, the requirement that a depository institution give 90 days prior notice to customers and regulatory authorities before closing any branch, and a prohibition on the acceptance or renewal of brokered deposits by depository institutions that are not well capitalized or are adequately capitalized and have not received a waiver from the FDIC. Comerica and its bank subsidiaries are subject to risk-based capital requirements and guidelines imposed by the FRB and/or the OCC. For this purpose, a depository institution's or holding company's assets and certain specified off-balance sheet commitments are assigned to four risk categories, each weighted differently based on the level of credit risk that is ascribed to such assets or commitments. A depository institution's or holding company's capital, in turn, is divided into two tiers: core (“Tier 1”) capital, which includes common equity, non-cumulative perpetual preferred stock, a limited amount of cumulative perpetual preferred stock and related surplus (excluding auction rate issues) and minority interests in equity accounts of consolidated subsidiaries, less goodwill, certain identifiable intangible assets and certain other assets; and supplementary (“Tier 2”) capital, which includes, among other items, perpetual preferred stock not meeting the Tier 1 definition, mandatory convertible securities, subordinated debt, and allowances for loan and lease losses, subject to certain limitations, less certain required deductions. Bank holding companies that engage in trading activities, whose trading activities exceed specified levels, also are required to maintain capital for market risk. Market risk includes changes in the market value of trading account, foreign exchange, and commodity positions, whether resulting from broad market movements (such as changes in the general level of interest rates, equity prices, foreign exchange rates, or commodity prices) or from position specific factors. From time to time, Comerica's trading activities may exceed specified regulatory levels, in which case Comerica maintains additional capital for market risk as required. Comerica, like other bank holding companies, currently is required to maintain Tier 1 and “total capital” (the sum of Tier 1 and Tier 2 capital) equal to at least 4% and 8% of its total risk-weighted assets (including certain off-balance-sheet items, such as standby letters of credit), respectively. At December 31, 2014, Comerica met both requirements, with Tier 1 and total capital equal to 10.50% and 12.51% of its total risk-weighted assets, respectively. Comerica is also required to maintain a minimum “leverage ratio” (Tier 1 capital to non-risk-adjusted total assets) of 3% to 4%, depending upon criteria defined and assessed by the FRB. Comerica's leverage ratio of 10.35% at December 31, 2014 reflects the nature of Comerica's balance sheet and demonstrates a commitment to capital adequacy. At December 31, 2014, Comerica Bank had Tier 1 and total capital equal to 10.36% and 12.02% of its total risk-weighted assets, respectively, and a leverage ratio of 10.20%. Additional information on the calculation of Comerica and its bank subsidiaries' Tier 1 capital, total capital and risk-weighted assets is set forth in Note 20 of the Notes to Consolidated Financial Statements located on pages F-99 through F-100 of the Financial Section of this report. Additional information on the timing and nature of the Basel III capital requirements is set forth below, under "Basel III: Regulatory Capital and Liquidity Regime." The FDIC Deposit Insurance Fund (“DIF”) provides insurance coverage for certain deposits. Comerica's subsidiary banks are subject to FDIC deposit insurance assessments to maintain the DIF. The FDIC imposes a risk-based deposit premium assessment system, which was amended pursuant to the Federal Deposit Insurance Reform Act of 2005 and further amended by the Dodd-Frank Act. The Dodd-Frank Act also increased the DIF's minimum reserve ratio and permanently increased general deposit insurance coverage from $100,000 to $250,000. The final rule implementing revisions to the assessment system became effective April 1, 2011. Under the risk-based deposit premium assessment system, the assessment rates for an insured depository institution are determined by an assessment rate calculator, which is based on a number of elements to measure the risk each institution poses to the DIF. The assessment rate is applied to total average assets less tangible equity. Under the current system, premiums are assessed quarterly. For 2014, Comerica’s FDIC insurance expense totaled $33 million. Our assessment rate could increase in the future under the current system if, for example, criticized loans and/or other higher risk assets increase or balance sheet liquidity decreases. The FRB and other federal and state banking agencies have broad enforcement powers, including, without limitation, and as prescribed to each agency by applicable law, the power to terminate deposit insurance, impose substantial fines and other civil penalties and appoint a conservator or receiver. Failure to comply with applicable laws or regulations could subject Comerica or its banking subsidiaries, as well as officers and directors of these organizations, to administrative sanctions and potentially substantial civil and criminal penalties. On November 14, 2008, Comerica participated in the United States Department of the Treasury (“U.S. Treasury”) Capital Purchase Program by issuing to the U.S. Treasury, in exchange for aggregate consideration of $2.25 billion, (i) 2.25 million shares of Fixed Rate Cumulative Perpetual Preferred Stock, Series F, no par value (the “Series F Preferred Stock”), and (ii) a warrant to purchase 11,479,592 shares of Comerica's common stock at an exercise price of $29.40 per share that expires on November 14, 2018 (the “Warrant”). Both the Series F Preferred Stock and the Warrant were accounted for as components of Comerica's regulatory Tier 1 capital and contained terms and limitations imposed by the U.S. Treasury. On March 17, 2010, Comerica fully redeemed the Series F Preferred Stock previously issued to the U.S. Treasury, and Comerica exited the Capital Purchase Program. The Warrant was separated into 11,479,592 warrants to purchase one share of Comerica's common stock at an exercise price of $29.40 per share, and such warrants are now listed and traded on the NYSE. As a result of participating in the Capital Purchase Program, Comerica was subject to certain executive compensation and corporate governance standards promulgated by the U.S. Treasury prior to redemption, which no longer applied to Comerica following the redemption. The recent financial crisis has led to significant changes in the legislative and regulatory landscape of the financial services industry, including the overhaul of that landscape with the passage of the Dodd-Frank Act, which was signed into law on July 21, 2010. Provided below is an overview of key elements of the Dodd-Frank Act relevant to Comerica, as well as other recent legislative and regulatory developments. The estimates of the impact on Comerica discussed below are based on information currently available and, if applicable, are subject to change until final rulemaking is complete. material amounts of risk, is based upon the key principles that a banking organization's incentive compensation arrangements (i) should provide employees incentives that appropriately balance risk and financial results in a manner that does not encourage employees to expose their organizations to imprudent risk; (ii) should be compatible with effective controls and risk-management; and (iii) should be supported by strong corporate governance, including active and effective oversight by the organization's board of directors. Banking organizations are expected to review regularly their incentive compensation arrangements based on these three principles. Where there are deficiencies in the incentive compensation arrangements, they should be promptly addressed. Enforcement actions may be taken against a banking organization if its incentive compensation arrangements, or related risk-management control or governance processes, pose a risk to the organization's safety and soundness, particularly if the organization is not taking prompt and effective measures to correct the deficiencies. Comerica is subject to this final guidance and, similar to other large banking organizations, has been subject to a continuing review of incentive compensation policies and practices by representatives of the FRB, the Federal Reserve Bank of Dallas and the Texas Department of Banking since 2011. As part of that review, Comerica has undertaken a thorough analysis of all the incentive compensation programs throughout the organization, the individuals covered by each plan and the risks inherent in each plan’s design and implementation. Comerica has determined that risks arising from employee compensation plans are not reasonably likely to have a material adverse effect on Comerica. Further, it is the Company’s intent to continue to evolve our processes going forward by monitoring regulations and best practices for sound incentive compensation. On April 14, 2011, the FRB, OCC and several other federal financial regulators issued a joint proposed rulemaking to implement Section 956 of the Dodd-Frank Act. Section 956 directed regulators to jointly prescribe regulations or guidelines prohibiting incentive-based payment arrangements, or any feature of any such arrangement, at covered financial institutions that encourage inappropriate risks by providing excessive compensation or that could lead to a material financial loss. This proposal supplements the final guidance issued by the banking agencies in June 2010. Consistent with the Dodd-Frank Act, the proposed rule would not apply to institutions with total consolidated assets of less than $1 billion, and would impose heightened standards for institutions with $50 billion or more in total consolidated assets, which includes Comerica. For these larger institutions, the proposed rule would require that at least 50 percent of annual incentive-based payments be deferred over a period of at least three years for designated executives. Moreover, boards of directors of these larger institutions would be required to identify employees who individually have the ability to expose the institution to possible losses that are substantial in relation to the institution's size, capital or overall risk tolerance, and to determine that the incentive compensation for these employees appropriately balances risk and rewards according to enumerated standards. Comerica is monitoring the development of this rule. Basel III: Regulatory Capital and Liquidity Regime. In December 2010, the Basel Committee on Banking Supervision (the “Basel Committee”) issued a framework for strengthening international capital and liquidity regulation (“Basel III”). In July 2013, U.S. banking regulators issued a final rule for the U.S. adoption of the Basel III regulatory capital framework. The regulatory framework includes a more conservative definition of capital, two new capital buffers - a conservation buffer and a countercyclical buffer, new and more stringent risk weight categories for assets and off-balance sheet items, and a supplemental leverage ratio. As a banking organization subject to the standardized approach, the rules are effective for Comerica on January 1, 2015, with certain transition provisions fully phased in on January 1, 2018. According to the rule, Comerica will be subject to the capital conservation buffer of 2.5 percent, when fully phased in, to avoid restrictions on capital distributions and discretionary bonuses. However, the rules do not subject Comerica to the capital countercyclical buffer of up to 2.5 percent or the supplemental leverage ratio. Comerica estimates the December 31, 2014 Tier 1 and Tier 1 common risk-based ratio would be 10.3 percent if calculated under the final rule, as fully phased in, excluding most elements of accumulated other comprehensive income from regulatory capital. Comerica's December 31, 2014 estimated Tier 1 common and Tier 1 capital ratios exceed the minimum required by the final rule (7 percent and 8.5 percent, respectively, including the fully phased-in capital conservation buffer). For a reconcilement of these non-GAAP financial measures, see page F-41 of the Financial Section of this report under the caption "Supplemental Financial Data." On December 9, 2014, U.S. banking regulators proposed a rule that would establish an additional capital buffer for banking organizations deemed systemically important to the global financial system (globally systemically important bank holding companies, or “G-SIB”). Comerica would not be considered a G-SIB under the rule as proposed. On September 3, 2014, U.S. banking regulators adopted the Liquidity Coverage Ratio ("LCR") rule, which set for U.S. banks the minimum liquidity measure established under the Basel III liquidity framework. Under the final rule, Comerica is subject to a modified LCR standard, which requires a financial institution to hold a minimum level of high-quality, liquid assets ("HQLA") to fully cover net cash outflows under a 30-day systematic liquidity stress scenario. The rule is effective for Comerica on January 1, 2016. During the transition year, 2016, Comerica will be required to maintain a minimum LCR of 90 percent. Beginning January 1, 2017, and thereafter, the minimum required LCR will be 100 percent. Comerica continues to evaluate the impact of the rule; however, we expect to meet the final requirements adopted by U.S. banking regulators within the required timetable. To reach full compliance and provide a buffer for normal volatility in balance sheet dynamics, Comerica expects to add additional HQLA, which may be funded with additional debt, in the future. Comerica does not currently expect compliance with the LCR rule will have a significant impact on net interest income. The Basel III liquidity framework includes a second minimum liquidity measure, the Net Stable Funding Ratio ("NSFR"), which requires the amount of available longer-term, stable sources of funding to be at least 100 percent of the required amount of longer-term stable funding over a one-year period. The Basel Committee on Banking Supervision is in the process of reviewing the proposed NSFR standard and evaluating its impact on the banking system. U.S. banking regulators have announced that they expect to issue proposed rulemaking to implement the NFSR in advance of its scheduled global implementation in 2018. While uncertainty exists in the final form and timing of the U.S. rule implementing the NSFR and whether or not Comerica will be subject to the full requirements, Comerica is closely monitoring the development of the rule. Interchange Fees. On July 20, 2011, the FRB published final rules pursuant to the Dodd-Frank Act establishing the maximum permissible interchange fee that an issuer may receive for an electronic debit transaction as the sum of 21 cents per transaction and 5 basis points multiplied by the value of the transaction and prohibiting network exclusivity arrangements and routing restrictions. Comerica is subject to the final rules. In July 2013, a federal district court invalidated the FRB's interchange fee rules. The FRB's appeal of the court’s ruling resulted in the U.S. Circuit Court of Appeals for the District of Columbia overruling the district court, reinstating the final rule as previously issued. On January 20, 2015, the U.S. Supreme Court denied a further appeal. Supervision and Regulation Assessment. Section 318 of the Dodd-Frank Act authorizes the federal banking agencies to assess fees against bank holding companies with total consolidated assets in excess of $50 billion equal to the expenses necessary or appropriate in order to carry out their supervision and regulation of those companies. We paid $1.5 million in 2014 with respect to the 2013 assessment year and accrued another $1.5 million for the 2014 assessment year. The Volcker Rule. The federal banking agencies and the SEC published approved joint final regulations to implement the Volcker Rule on December 10, 2013. The Volcker Rule generally prohibits banking entities from engaging in proprietary trading and from owning and sponsoring "covered funds" (e.g. hedge funds and private equity funds). The final regulations adopt a multi-faceted approach to implementing the Volcker Rule prohibitions that relies on: (i) detailed descriptions of prohibited and permitted activities; (ii) detailed compliance requirements; and (iii) for banking entities with large volumes of trading activity, detailed quantitative analysis and reporting obligations. In addition to rules implementing the core prohibitions and exemptions (e.g. underwriting, market-making related activities, risk-mitigating hedging and trading in certain government obligations) of the Volcker Rule, the regulations also include two appendices devoted to record-keeping and reporting requirements, including numerous quantitative data reporting obligations for banking entities with significant trading activities (Appendix A) and enhanced compliance requirements for banking entities with significant trading or covered fund activities (Appendix B). The final rule was effective April 1, 2014. The Volcker Rule generally requires full compliance with the new restrictions by July 21, 2015; however, the FRB has recently extended the conformance period to July 21, 2017 for covered funds that were in place prior to December 31, 2013. Comerica expects to meet the final requirements adopted by regulators within the applicable regulatory timelines. Additional information on Comerica's portfolio of indirect (through funds) private equity and venture capital investments is set forth in Note 1 of the Notes to Consolidated Financial Statements located on page F-51 of the Financial Section of this report. Annual Capital Plans and Stress Tests. Comerica is subject to the FRB’s annual Comprehensive Capital Analysis and Review (CCAR) process, as well as the Dodd-Frank Act Stress Testing (DFAST) requirements. As part of the CCAR process, the FRB undertakes a supervisory assessment of the capital adequacy of bank holding companies (BHCs), including Comerica, that have $50 billion or more in total consolidated assets. This capital adequacy assessment is based on a review of a comprehensive capital plan submitted by each participating BHC to the FRB that describes the company’s planned capital actions during the nine quarter review period, as well as the results of stress tests conducted by both the company and the FRB under different hypothetical macro-economic scenarios, including a supervisory baseline and an adverse and a severely adverse scenario provided by the FRB. After completing its review, the FRB may object or not object to the company’s proposed capital actions, such as plans to pay or increase common stock dividends, reinstate or increase common stock repurchase programs, or redeem preferred stock or other regulatory capital instruments. In connection with the 2014 CCAR, Comerica submitted its 2014 capital plan to the FRB on January 3, 2014; on March 26, 2014, Comerica announced that the FRB had completed its CCAR 2014 capital plan review and did not object to the capital plan or capital distributions contemplated in the plan. Also as required, Comerica submitted its CCAR 2015 capital plan to the FRB on January 5, 2015 and expects to receive the results of the FRB's review of the plan in March 2015. As part of the CCAR and DFAST process, both the FRB and Comerica release certain revenue, loss and capital results from their stress testing exercises, generally in March of each year. FRB regulations also require that Comerica and other large bank holding companies conduct a separate mid-year stress test using financial data as of March 31st and three company-derived macro-economic scenarios (base, adverse and severely adverse) and publish a summary of the results under the severely adverse scenario in September. On March 20, 2014 and September 15, 2014, Comerica released the results of its company-run annual and mid-year stress tests, respectively, which are available in the Investor Relations section of Comerica's website at investor.comerica.com, on the “Dodd-Frank Act Stress Test Results” page under "Financial Reports." Similar timelines will be expected for the 2015 mid-year stress tests. of July). Accordingly, for the 2015 Capital Plan submission, the FRB’s determination regarding capital distributions will extend over a period of five quarters, 2Q 2015 - 2Q 2016, in order to accommodate the shift in the capital plan cycle in 2016. Enhanced Prudential Requirements. The Dodd-Frank Act created the Financial Stability Oversight Council (“FSOC”) to coordinate efforts of the primary U.S. financial regulatory agencies in establishing regulations to address financial stability concerns and to make recommendations to the FRB as to enhanced prudential standards that must apply to large, interconnected bank holding companies and nonbank financial companies supervised by the FRB under the Dodd-Frank Act, including capital, leverage, liquidity and risk management requirements. On February 18, 2014, the FRB issued its final regulations to implement the enhanced prudential and supervisory requirements mandated by the Dodd-Frank Act. The final regulations address enhanced risk-based capital and leverage requirements, enhanced liquidity requirements, enhanced risk management and risk committee requirements, single-counterparty credit limits, semiannual stress tests (as described above under "Annual Capital Plans and Stress Tests"), and a debt-to-equity limit for companies determined to pose a grave threat to financial stability. They are intended to allow regulators to more effectively supervise large bank holding companies and nonbank financial firms whose failure could impact the stability of the US financial system, and generally build on existing US and international regulatory guidance. The proposal also takes a multi-stage or phased approach to many of the requirements (such as the capital and liquidity requirements). Most of these requirements apply to Comerica because it has consolidated assets of more than $50 billion. Comerica has or will implement all requirements of the new rules within regulatory timelines. Resolution (Living Will) Plans. Section 165(d) of the Dodd-Frank Act requires bank holding companies with total consolidated assets of $50 billion or more (“covered companies”) to prepare and submit to the federal banking agencies (e.g., FRB and FDIC) a plan for their rapid and orderly resolution under the U.S. Bankruptcy Code. Covered companies, such as Comerica, with less than $100 billion in total nonbank assets were required to submit their initial plans by December 31, 2013. In addition, Section 165(d) requires FDIC-insured depository institutions (like Comerica Bank) with assets of $50 billion or more to develop, maintain, and periodically submit plans outlining how the FDIC would resolve it through the FDIC's resolution powers under the Federal Deposit Insurance Act. The federal banking agencies have issued rules to implement these requirements. In addition, those rules require the filing of annual updates to the plans. Both Comerica and Comerica Bank filed their respective initial and updated resolution plans by the required due dates. The resolution plans are currently under review by the FRB and FDIC. Section 611 and Title VII of the Dodd-Frank Act. Section 611 of the Dodd-Frank Act prohibits a state bank from engaging in derivative transactions unless the lending limit laws of the state in which the bank is chartered take into consideration exposure to derivatives. Section 611 does not provide how state lending limit laws must factor in derivatives. The Texas Finance Commission has adopted an administrative rule meeting the requirements of Section 611. Accordingly, Comerica Bank may engage in derivative transactions, as permitted by applicable law. Title VII of the Dodd-Frank Act establishes a comprehensive framework for over-the-counter (“OTC”) derivatives transactions. The structure for derivatives set forth in the Dodd-Frank Act is intended to promote, among other things, exchange trading and centralized clearing of swaps and security-based swaps, as well as greater transparency in the derivatives markets and enhanced monitoring of the entities that use these markets. In this regard, the CFTC and SEC have issued several regulatory proposals, some of which are now effective or will become effective in 2015. The SEC and CFTC have jointly adopted rules further defining the terms “swap,” “security-based swap,” “security-based swap agreement,” and have also adopted final joint rules defining the terms “swap dealer,” “security-based swap dealer,” “major swap participant,” and “major security-based swap participant.” Comerica has determined that neither it, nor its subsidiaries, are within the definition of “swap dealer” or “major swap participant,” but some portions of the Title VII regulations apply nonetheless. One of these regulations centers on limiting certain OTC transactions to “eligible contract participants.” This regulation may have an impact on the small business customers of Comerica's banking subsidiaries by making such customers ineligible for swap derivatives as hedging in their loan agreements. Consumer Finance Regulations. The Dodd-Frank Act made several changes to consumer finance laws and regulations. It contained provisions that have weakened the federal preemption rules applicable for national banks and give state attorneys general the ability to enforce federal consumer protection laws. Additionally, the Dodd-Frank Act created the Consumer Financial Protection Bureau (“CFPB“), which has a broad rule-making authority for a wide range of consumer protection laws that apply to all banks and savings institutions, including the authority to prohibit “unfair, deceptive or abusive” acts and practices, and possesses examination and enforcement authority over all banks and savings institutions with more than $10 billion in assets. In this regard, the CFPB has commenced issuing several new rules to implement various provisions of the Dodd-Frank Act that were specifically identified as being enforced by the CFPB, as well as those specified for supervisory and enforcement authority for very large depository institutions and non-depository (nonbank) entities. Comerica is subject to CFPB foreign remittance rules and home mortgage lending rules, in addition to certain other CFPB rules. provide protections to consumers who transfer funds to recipients located in countries outside the United States (customer foreign remittance transfers). In general, the regulation requires remittance transfer providers, such as Comerica, to disclose to a consumer the exchange rate, fees, and amount to be received by the recipient when the consumer sends a remittance transfer. Although Comerica had implemented the model disclosures provided in Appendix A to the final rule, on September 18, 2014, the CFPB extended the compliance exception period for the rule's new disclosure requirements to July 21, 2020. On July 17, 2014, the CFPB issued an interpretive rule clarifying that where a successor-in-interest (successor) who has previously acquired title to a dwelling agrees to be added as obligor or substituted for the existing obligor on a consumer credit transaction secured by that dwelling, the creditor's written acknowledgment of the successor as obligor is not subject to the CFPB’s Ability-to-Repay Rule because such a transaction does not constitute an assumption as defined by Regulation Z. In addition, the CFPB issued other Regulation Z-related rules that had little or no effect on Comerica’s operations as it has outsourced most of its consumer loan origination and servicing. On November 13, 2014, the CFPB issued a proposed regulation establishing new consumer protections and disclosure requirements on prepaid accounts, including (i) the provision of either periodic statements or free online account information access; (ii) new account error and unauthorized transaction rights; (iii) new “Know Before You Owe” prepaid account disclosures; (iv) public disclosure of account agreements for prepaid accounts and (v) credit protection for linked credit accounts. Comerica is monitoring the development of these new rules and will position itself to be in compliance with any new requirements within the established regulatory time frames. Truth in Lending Act. As a result of recent judicial decisions, borrowers are permitted to rescind their mortgage pursuant to the Truth in Lending Act by giving notice of their intent to rescind within three years of closing, and do not need to file suit to exercise this right. This decision could impact Comerica’s indemnity rights with its mortgage servicing vendor, as well as consumer closed-end mortgage loans held in Comerica’s portfolio; however, such impact is not anticipated to be significant. FDIC Guidance on Brokered Deposits. On January 5, 2015, the FDIC issued guidance in the form of “Frequently Asked Questions” to promote consistency by insured depository institutions in identifying, accepting, and reporting brokered deposits. All insured depository institutions (including those that are well capitalized) must report brokered deposits in their Consolidated Reports of Condition and Income (Call Reports). Comerica is currently evaluating the impact of these FAQs to various business units throughout the organization. Flood Insurance Reform. The Biggert-Waters Flood Insurance Reform Act of 2012 (“Biggert-Waters Act”), as amended by the Homeowner Flood Insurance Affordability Act of 2014, modified the National Flood Insurance Program by: (i) increasing the maximum civil penalty for Flood Disaster Protection Act violations to $2,000 and eliminating the annual penalty cap; (ii) requiring certain lenders (including Comerica) to escrow premiums and fees for flood insurance on residential improved real estate; (iii) directing lenders to accept private flood insurance and to notify borrowers of its availability; (iv) amending the force placement requirement provisions; and (v) permitting lenders to charge borrowers costs for lapses in or insufficient coverage. These requirements will impact Comerica loans and extensions of credit secured with residential improved real estate. The civil penalty and force placed insurance provisions were effective immediately. On October 21, 2014, certain federal agencies issued a joint proposed rule exempting: (1) detached structures that are not used as a residence from the mandatory flood insurance purchase requirements and (2) HELOCs, business purpose loans, nonperforming loans, loans with terms of less than one year, loans for co-ops and condominiums, and subordinate loans on the same property from the mandatory escrow of flood insurance premium requirements. Additionally, the proposed rule would require Comerica to offer the option to escrow flood insurance premiums starting on January 1, 2016. The federal agencies will address the remaining provisions of the Biggert-Waters Act in a separate rulemaking. Comerica will continue to monitor the development and implementation of these rules. The environment in which financial institutions will operate after the recent financial crisis, including legislative and regulatory changes affecting capital, liquidity, supervision, permissible activities, corporate governance and compensation, and changes in fiscal policy, may have long-term effects on the business model and profitability of financial institutions that cannot be foreseen. Moreover, in light of recent events and current conditions in the U.S. financial markets and economy, Congress and regulators have continued to increase their focus on the regulation of the financial services industry. Comerica cannot accurately predict whether legislative changes will occur or, if they occur, the ultimate effect they would have upon the financial condition or results of operations of Comerica. People: Including the competence, integrity and succession planning of customers. Purpose: The legal, logical and productive purposes of the credit facility. Payment: Including the source, timing and probability of payment. Protection: Including obtaining alternative sources of repayment, securing the loan, as appropriate, with collateral and/or third-party guarantees and ensuring appropriate legal documentation is obtained. Perspective: The risk/reward relationship and pricing elements (cost of funds; servicing costs; time value of money; credit risk). Comerica prices credit facilities to reflect risk, the related costs and the expected return, while maintaining competitiveness with other financial institutions. Loans with variable and fixed rates are underwritten to achieve expected risk-adjusted returns on the credit facilities and for the full relationship including the borrower's ability to repay the principal and interest based on such rates. Comerica maintains a Credit Administration Department (“Credit Administration”) which is responsible for the oversight and monitoring of our loan portfolio. Credit Administration assists with underwriting by providing objective financial analysis, including an assessment of the borrower's business model, balance sheet, cash flow and collateral. Each borrower relationship is assigned an internal risk rating by Credit Administration. Further, Credit Administration updates the assigned internal risk rating for every borrower relationship as new information becomes available, either as a result of periodic reviews of the credit quality or as a result of a change in borrower performance. The goal of the internal risk rating framework is to improve Comerica's risk management capability, including its ability to identify and manage changes in the credit risk profile of its portfolio, predict future losses and price the loans appropriately for risk. Comerica maintains a comprehensive set of credit policies. Comerica's credit policies provide individual relationship managers, as well as loan committees, approval authorities based on our internal risk rating system and establish maximum exposure limits based on risk ratings and Comerica's legal lending limit. Credit Administration, in conjunction with the businesses units, monitors compliance with the credit policies and modifies the existing policies as necessary. New or modified policies/guidelines require approval by the Strategic Credit Committee, chaired by Comerica's Chief Credit Officer and comprising senior credit, market and risk management executives. Periodic review of financial statements including financial statements audited by an independent certified public accountant when appropriate. The pro-forma financial condition including financial projections. The borrower's sources and uses of funds. The borrower's debt service capacity. A comprehensive review of the quality and value of collateral, including independent third-party appraisals of machinery and equipment and commercial real estate, as appropriate, to determine the advance rates. Physical inspection of collateral and audits of receivables, as appropriate. For additional information specific to our Energy loan portfolio, please see the caption, “Energy Lending” on pages F-28 through F-29 of the Financial Section of this report. consistent with the approach described above and provide maximum loan-to-value ratios that limit the size of a loan to a maximum percentage of the value of the real estate collateral securing the loan. The loan-to-value percentage varies by the type of collateral and is limited by advance rates established by our regulators. Our loan-to-value limitations are, in certain cases, more restrictive than those required by regulators and are influenced by other risk factors such as the financial strength of the borrower or guarantor, the equity provided to the project and the viability of the project itself. CRE loans generally require cash equity. CRE loans are normally originated with full recourse or limited recourse to all principals and owners. There are limitations to the size of a single project loan and to the aggregate dollar exposure to a single guarantor. Comerica's consumer and residential mortgage loans are originated consistent with the underwriting approach described above, but also includes an assessment of each borrower's personal financial condition, including a review of credit reports and related FICO scores (a type of credit score used to assess an applicant's credit risk) and verification of income and assets. Comerica does not originate subprime loan programs. Although a standard industry definition for subprime loans (including subprime mortgage loans) does not exist, Comerica defines subprime loans as specific product offerings for higher risk borrowers, including individuals with one or a combination of high credit risk factors. These credit factors include low FICO scores, poor patterns of payment history, high debt-to-income ratios and elevated loan-to-value. We generally consider subprime FICO scores to be those below 620 on a secured basis (excluding loans with cash or near-cash collateral and adequate income to make payments) and below 660 for unsecured loans. Residential mortgage loans retained in the portfolio are largely relationship based. The remaining loans are typically eligible to be sold on the secondary market. Adjustable rate loans are limited to standard conventional loan programs. As of December 31, 2014, Comerica and its subsidiaries had 8,499 full-time and 616 part-time employees. Comerica maintains an Internet website at www.comerica.com where the Annual Report on Form 10-K, Quarterly Reports on Form 10-Q, Current Reports on Form 8-K and all amendments to those reports are available without charge, as soon as reasonably practicable after those reports are filed with or furnished to the SEC. The Code of Business Conduct and Ethics for Employees, the Code of Business Conduct and Ethics for Members of the Board of Directors and the Senior Financial Officer Code of Ethics adopted by Comerica are also available on the Internet website and are available in print to any shareholder who requests them. Such requests should be made in writing to the Corporate Secretary at Comerica Incorporated, Comerica Bank Tower, 1717 Main Street, MC 6404, Dallas, Texas 75201. In addition, pursuant to regulations adopted by the FRB, Comerica will be required to make additional regulatory capital-related disclosures beginning in 2015. Under these regulations, Comerica may be able to satisfy at least a portion of these requirements through postings on its website, and Comerica has done so and expects to continue to do so without also providing disclosure of this information through filings with the SEC. Where we have included web addresses in this report, such as our web address and the web address of the SEC, we have included those web addresses as inactive textual references only. Except as specifically incorporated by reference into this report, information on those websites is not part hereof. This report includes forward-looking statements as defined in the Private Securities Litigation Reform Act of 1995. In addition, Comerica may make other written and oral communications from time to time that contain such statements. All statements regarding Comerica's expected financial position, strategies and growth prospects and general economic conditions Comerica expects to exist in the future are forward-looking statements. The words, “anticipates,” “believes,” “feels,” “expects,” “estimates,” “seeks,” “strives,” “plans,” “intends,” “outlook,” “forecast,” “position,” “target,” “mission,” “assume,” “achievable,” “potential,” “strategy,” “goal,” “aspiration,” "opportunity," "initiative," “outcome,” “continue,” “remain,” “maintain,” "on course," “trend,” “objective,” "looks forward," "projects," "models" and variations of such words and similar expressions, or future or conditional verbs such as “will,” “would,” “should,” “could,” “might,” “can,” “may” or similar expressions, as they relate to Comerica or its management, are intended to identify forward-looking statements. Comerica cautions that forward-looking statements are subject to numerous assumptions, risks and uncertainties, which change over time. Forward-looking statements speak only as of the date the statement is made, and Comerica does not undertake to update forward-looking statements to reflect facts, circumstances, assumptions or events that occur after the date the forward-looking statements are made. Actual results could differ materially from those anticipated in forward-looking statements and future results could differ materially from historical performance. could cause actual results to differ materially from forward-looking statements, and future results could differ materially from historical performance. General political, economic or industry conditions, either domestically or internationally, may be less favorable than expected. Local, domestic, and international economic, political and industry specific conditions affect the financial services industry, directly and indirectly. Conditions such as or related to inflation, recession, unemployment, volatile interest rates, international conflicts and other factors, such as real estate values, energy prices, state and local municipal budget deficits, the recent European debt crisis and government spending and the U.S. national debt, outside of our control may, directly and indirectly, adversely affect Comerica. As has been the case with the impact of recent economic conditions, economic downturns could result in the delinquency of outstanding loans, which could have a material adverse impact on Comerica's earnings. Governmental monetary and fiscal policies may adversely affect the financial services industry, and therefore impact Comerica's financial condition and results of operations. Monetary and fiscal policies of various governmental and regulatory agencies, in particular the FRB, affect the financial services industry, directly and indirectly. The FRB regulates the supply of money and credit in the U.S. and its monetary and fiscal policies determine in a large part Comerica's cost of funds for lending and investing and the return that can be earned on such loans and investments. Changes in such policies, including changes in interest rates, will influence the origination of loans, the value of investments, the generation of deposits and the rates received on loans and investment securities and paid on deposits. Changes in monetary and fiscal policies are beyond Comerica's control and difficult to predict. Comerica's financial condition and results of operations could be materially adversely impacted by changes in governmental monetary and fiscal policies. Changes in regulation or oversight may have a material adverse impact on Comerica's operations. Comerica is subject to extensive regulation, supervision and examination by the U.S. Treasury, the Texas Department of Banking, the FDIC, the FRB, the SEC, FINRA and other regulatory bodies. Such regulation and supervision governs the activities in which Comerica may engage. Regulatory authorities have extensive discretion in their supervisory and enforcement activities, including the imposition of restrictions on Comerica's operations, investigations and limitations related to Comerica's securities, the classification of Comerica's assets and determination of the level of Comerica's allowance for loan losses. Any change in such regulation and oversight, whether in the form of regulatory policy, regulations, legislation or supervisory action, may have a material adverse impact on Comerica's business, financial condition or results of operations. In particular, Congress and other regulators have significantly increased their focus on the regulation of the financial services industry. Their actions include, but are not limited to, the passage of the Dodd-Frank Act, many parts of which are now in effect, and the adoption of the Basel III framework in the U.S. For additional information on these actions, please see “The Dodd-Frank Wall Street Reform and Consumer Protection Act and Other Recent Legislative and Regulatory Developments” section of the “Supervisory and Regulation” section of this report. Many provisions in the Dodd-Frank Act and the Basel III framework remain subject to regulatory rule-making and/or implementation, the effects of which are not yet known. Additionally, Comerica may be subject to other regulatory actions that are currently under consideration, or may be under consideration in the future. For example, as discussed in the “The Dodd-Frank Wall Street Reform and Consumer Protection Act and Other Recent Legislative and Regulatory Developments” section of the “Supervisory and Regulation” section of this report, Comerica is not subject to the additional capital buffer for banking organizations deemed systemically important to the global financial system. However, should U.S. banking regulators establish an additional capital buffer for banking organizations deemed systemically important to the U.S. financial system, Comerica may be subject to an additional buffer. Further, the current administration proposed in January 2010 a fee on those financial institutions that benefited from recent actions taken by the U.S. government to stabilize the financial system. Calls for that fee were renewed during the 2013 federal budget discussions. Most recently, the administration's 2015 budget proposal would impose a 7 basis point tax on U.S. financial firms with assets over $50 billion, with the goal of such proposal to penalize financial institutions for being overly leveraged. If such fee or another similar fee were implemented, Comerica would likely be subject to its terms. The effects of such legislation and regulatory actions on Comerica cannot reliably be fully determined at this time. We can neither predict when or whether future regulatory or legislative reforms will be enacted nor what their contents will be. The impact of any future legislation or regulatory actions on Comerica's businesses or operations cannot be reliably determined at this time, and such impact may adversely affect Comerica. Comerica must maintain adequate sources of funding and liquidity to meet regulatory expectations, support its operations and fund outstanding liabilities. Comerica’s liquidity and ability to fund and run its business could be materially adversely affected by a variety of conditions and factors, including financial and credit market disruptions and volatility or a lack of market or customer confidence in financial markets in general, which may result in a loss of customer deposits or outflows of cash or collateral and/or ability to access capital markets on favorable terms. Other conditions and factors that could materially adversely affect Comerica’s liquidity and funding include a lack of market or customer confidence in, or negative news about, Comerica or the financial services industry generally which also may result in a loss of deposits and/or negatively affect the ability to access the capital markets; the loss of customer deposits to alternative investments; counterparty availability; interest rate fluctuations; general economic conditions; and the legal, regulatory, accounting and tax environments governing our funding transactions. Many of the above conditions and factors may be caused by events over which Comerica has little or no control. There can be no assurance that significant disruption and volatility in the financial markets will not occur in the future. Further, Comerica's customers may be adversely impacted by such conditions, which could have a negative impact on Comerica's business, financial condition and results of operations. In September 2014, U.S. banking regulators issued a final rule implementing a quantitative liquidity requirement in the U.S. generally consistent with the Liquidity Coverage Ratio (LCR) minimum liquidity measure established under the Basel III liquidity framework. Under the rule, Comerica will be required to hold a minimum level of high-quality, liquid assets (HQLA) to fully cover modified net cash outflows under a 30-day systematic liquidity stress scenario. The rule is effective for Comerica on January 1, 2016. During the transition year, 2016, Comerica will be required to maintain a minimum LCR of 90 percent. Beginning January 1, 2017, and thereafter, the minimum required LCR will be 100 percent. To reach full compliance and provide a buffer for normal volatility in balance sheet dynamics, Comerica expects to add additional HQLA, which may be funded with additional debt, in the future. For more information regarding the LCR, please see the “Supervision and Regulation” section of this report. The inability to access capital markets funding sources as needed could adversely impact our level of regulatory-qualifying capital and ability to comply with the LCR framework. Further, if Comerica is unable to continue to fund assets through customer bank deposits or access funding sources on favorable terms or if Comerica suffers an increase in borrowing costs or otherwise fails to manage liquidity effectively, Comerica’s liquidity, operating margins, financial condition and results of operations may be materially adversely affected. Compliance with more stringent capital and liquidity requirements may adversely affect Comerica. New capital requirements in connection with Basel III and the requirements of the Dodd-Frank Act applicable to Comerica as a bank holding company as well as to Comerica's subsidiary banks will have an effect on Comerica. Additional information on the regulatory capital requirements applicable to Comerica is set forth in the “Supervision and Regulation” section of this report. These requirements, and any other new laws or regulations, could adversely affect Comerica's ability to pay dividends or make share repurchases, or could require Comerica to reduce business levels or to raise capital, including in ways that may adversely affect its results of operations or financial condition and/or existing shareholders. The liquidity requirements applicable to Comerica as a bank holding company as well as to our subsidiary banks are in the process of being substantially revised, in connection with recent supervisory guidance, Basel III and the requirements of the Dodd-Frank Act. Additional information on the liquidity requirements applicable to Comerica is set forth in the “Supervision and Regulation” section of this report. In light of these or other new legal and regulatory requirements, Comerica and our subsidiary banks are, and will be in the future, required to satisfy additional, more stringent, liquidity standards, including, for the first time, quantitative standards for liquidity management. Further, our regulators may also require us to satisfy additional, more stringent capital adequacy and liquidity standards than those specified as part of the Dodd-Frank Act and the FRB's proposed and final rules implementing Basel III, or comply with the requirements of these standards earlier than might otherwise be required, in connection with the annual CCAR process. The ultimate impact of the new capital and liquidity standards cannot be fully determined at this time and will depend on a number of factors, including treatment and implementation by the U.S. banking regulators. However, maintaining higher levels of capital and liquidity may reduce Comerica's profitability and otherwise adversely affect its business, financial condition, or results of operations. Declines in the businesses or industries of Comerica's customers could cause increased credit losses or decreased loan balances, which could adversely affect Comerica. conditions, supply chain factors and/or commodities prices. Any decline in one of those customers' businesses or industries could cause increased credit losses, which in turn could adversely affect Comerica. Further, any decline in these businesses or industries could cause decreased borrowings, either due to reduced demand or reductions in the borrowing base available for each customer loan. In particular, oil and gas prices have fallen sharply since mid-2014. Loans in the Middle Market - Energy business line were $3.6 billion, or approximately 7 percent of total loans, at December 31, 2014. If oil and gas prices remain depressed for a prolonged period of time, Comerica's energy portfolio could decrease and/or experience increased credit losses, which could adversely affect Comerica's financial results. Operational difficulties, failure of technology infrastructure or information security incidents could adversely affect Comerica's business and operations. Comerica is exposed to many types of operational risk, including legal risk, the risk of fraud or theft by employees or outsiders, failure of Comerica's controls and procedures and unauthorized transactions by employees or operational errors, including clerical or recordkeeping errors or those resulting from computer or telecommunications systems malfunctions. Given the high volume of transactions at Comerica, certain errors may be repeated or compounded before they are identified and resolved. The occurrence of such operational risks can lead to other types of risks including reputational and compliance risks that may amplify the adverse impact to Comerica. In particular, Comerica's operations rely on the secure processing, storage and transmission of confidential and other information on its technology systems and networks. Any failure, interruption or breach in security of these systems could result in failures or disruptions in Comerica's customer relationship management, general ledger, deposit, loan and other systems. Comerica may also be subject to disruptions of its operating systems arising from events that are wholly or partially beyond its control, which may include, for example, computer viruses, cyber attacks (including cyber attacks resulting in the destruction or exfiltration of data and systems), spikes in transaction volume and/or customer activity, electrical or telecommunications outages, or natural disasters. Although Comerica has programs in place related to business continuity, disaster recovery and information security to maintain the confidentiality, integrity, and availability of its systems, business applications and customer information, such disruptions may give rise to interruptions in service to customers and loss or liability to Comerica. For example, along with a number of other large financial institutions' websites, Comerica’s website, www.comerica.com, was subject to denial of service attacks in 2013. These events did not result in a breach of Comerica’s client data, and account information remained secure; however, during one attack, some customers may have been prevented from accessing Comerica Bank’s secure websites through www.comerica.com. In all cases, the attacks primarily resulted in inconvenience; however, future cyber attacks could be more disruptive and damaging, and Comerica may not be able to anticipate or prevent all such attacks. The occurrence of any failure or interruption in Comerica's operations or information systems, or any security breach, could cause reputational damage, jeopardize the confidentiality of customer information, result in a loss of customer business, subject Comerica to regulatory intervention or expose it to civil litigation and financial loss or liability, any of which could have a material adverse effect on Comerica. Further, Comerica may be impacted by data breaches at retailers and other third parties who participate in data interchanges with Comerica customers that involve the theft of customer data, which may include the theft of Comerica debit card PIN numbers and commercial cards used to make purchases at such retailers and other third parties. Such data breaches could result in Comerica incurring significant expenses to reissue debit cards and cover losses, which could result in a material adverse effect on its results of operations. Comerica relies on other companies to provide certain key components of its business infrastructure, and certain failures could materially adversely affect operations. Comerica faces the risk of operational disruption, failure or capacity constraints due to its dependency on third party vendors for components of its business infrastructure. Third party vendors provide certain key components of Comerica's business infrastructure, such as data processing and storage, payment processing services, recording and monitoring transactions, internet connections and network access, clearing agency and card processing services. While Comerica conducts due diligence prior to selecting these third party vendors, it does not control their operations. As such, any failure on the part of these business partners to perform their various responsibilities could also expose financial institutions to risks that can result in reputational problems, financial loss or regulatory actions, and otherwise adversely affect Comerica's business and operations. Additionally, federal banking regulators recently issued regulatory guidance on how banks select, engage and manage their outside vendors. These regulations may affect the circumstances and conditions under which we work with third parties and the cost of managing such relationships. Noninterest expenses are important to our profitability, but are subject to a number of factors, some of which are not in our control. Many factors can influence the amount of noninterest expenses, including changing regulations, rising pension and health care costs, technology and cybersecurity investments and litigation. The importance of managing expenses has been amplified in the current slow growth, low net interest margin business environment. Comerica's noninterest expenses may increase more than anticipated, which could result in an adverse impact on net income. Changes in the financial markets, including fluctuations in interest rates and their impact on deposit pricing, could adversely affect Comerica's net interest income and balance sheet. The operations of financial institutions such as Comerica are dependent to a large degree on net interest income, which is the difference between interest income from loans and investments and interest expense on deposits and borrowings. Prevailing economic conditions, the trade, fiscal and monetary policies of the federal government and the policies of various regulatory agencies all affect market rates of interest and the availability and cost of credit, which in turn significantly affect financial institutions' net interest income. Interest rates over the past several years have remained at low levels. A continued low interest rate environment could adversely affect the interest income Comerica earns on loans and investments. For a discussion of Comerica's interest rate sensitivity, please see, “Market and Liquidity Risk” beginning on page F-29 of the Financial Section of this report. Volatility in interest rates can also result in disintermediation, which is the flow of funds away from financial institutions into direct investments, such as federal government and corporate securities and other investment vehicles, which, because of the absence of federal insurance premiums and reserve requirements, generally pay higher rates of return than financial institutions. Comerica's financial results could be materially adversely impacted by changes in financial market conditions. Any reduction in our credit rating could adversely affect Comerica and/or the holders of its securities. Rating agencies regularly evaluate Comerica, and their ratings are based on a number of factors, including Comerica's financial strength as well as factors not entirely within its control, including conditions affecting the financial services industry generally. There can be no assurance that Comerica will maintain its current ratings. In March 2012, Moody's Investors Service downgraded Comerica's long-term and short-term senior credit ratings one notch to A3 and P-2, respectively. From July 2012 through October 2013, Fitch Ratings had Comerica's outlook as “Negative”; in October 2013, Fitch Ratings affirmed Comerica's rating while revising the outlook to “Stable.” In January 2015, Standard & Poor's revised its outlook on Comerica to "Negative" from "Stable." While recent credit rating actions have had little to no detrimental impact on Comerica's profitability, borrowing costs, or ability to access the capital markets, future downgrades to Comerica's or its subsidiaries' credit ratings could adversely affect Comerica's profitability, borrowing costs, or ability to access the capital markets or otherwise have a negative effect on Comerica's results of operations or financial condition. If such a reduction placed Comerica's or its subsidiaries' credit ratings below investment grade, it could also create obligations or liabilities under the terms of existing arrangements that could increase Comerica's costs under such arrangements. Additionally, a downgrade of the credit rating of any particular security issued by Comerica or its subsidiaries could negatively affect the ability of the holders of that security to sell the securities and the prices at which any such securities may be sold. Unfavorable developments concerning credit quality could adversely affect Comerica's financial results. Although Comerica regularly reviews credit exposure related to its customers and various industry sectors in which it has business relationships, default risk may arise from events or circumstances that are difficult to detect or foresee. Under such circumstances, Comerica could experience an increase in the level of provision for credit losses, nonperforming assets, net charge-offs and reserve for credit losses, which could adversely affect Comerica's financial results. The soundness of other financial institutions could adversely affect Comerica. Comerica's ability to engage in routine funding transactions could be adversely affected by the actions and commercial soundness of other financial institutions. Financial services institutions are interrelated as a result of trading, clearing, counterparty or other relationships. Comerica has exposure to many different industries and counterparties, and it routinely executes transactions with counterparties in the financial industry, including brokers and dealers, commercial banks, investment banks, mutual and hedge funds, and other institutional clients. As a result, defaults by, or even rumors or questions about, one or more financial services institutions, or the financial services industry generally, have led, and may further lead, to market-wide liquidity problems and could lead to losses or defaults by us or by other institutions. Many of these transactions could expose Comerica to credit risk in the event of default of its counterparty or client. In addition, Comerica's credit risk may be impacted when the collateral held by it cannot be realized upon or is liquidated at prices not sufficient to recover the full amount of the financial instrument exposure due to Comerica. There is no assurance that any such losses would not adversely affect, possible materially in nature, Comerica. The introduction, implementation, withdrawal, success and timing of business initiatives and strategies may be less successful or may be different than anticipated, which could adversely affect Comerica's business. Comerica makes certain projections and develops plans and strategies for its banking and financial products. If Comerica does not accurately determine demand for its banking and financial product needs, it could result in Comerica incurring significant expenses without the anticipated increases in revenue, which could result in a material adverse effect on its business. Comerica may not be able to utilize technology to efficiently and effectively develop, market, and deliver new products and services to its customers. The financial services industry experiences rapid technological change with regular introductions of new technology-driven products and services. The efficient and effective utilization of technology enables financial institutions to better serve customers and to reduce costs. Comerica's future success depends, in part, upon its ability to address the needs of its customers by using technology to market and deliver products and services that will satisfy customer demands, meet regulatory requirements, and create additional efficiencies in Comerica's operations. Comerica may not be able to effectively develop new technology-driven products and services or be successful in marketing or supporting these products and services to its customers, which could have a material adverse impact on Comerica's financial condition and results of operations. Competitive product and pricing pressures among financial institutions within Comerica's markets may change. Comerica operates in a very competitive environment, which is characterized by competition from a number of other financial institutions in each market in which it operates. Comerica competes in terms of products and pricing with large national and regional financial institutions and with smaller financial institutions. Some of Comerica's larger competitors, including certain nationwide banks that have a significant presence in Comerica's market area, may make available to their customers a broader array of product, pricing and structure alternatives and, due to their asset size, may more easily absorb loans in a larger overall portfolio. Some of Comerica's smaller competitors may have more liberal lending policies and processes. Additionally, the financial services industry has recently been subject to increasing regulation. For more information, see the “Supervision and Regulation” section of this report. Such regulations may require significant additional investments in technology, personnel or other resources or place limitations on the ability of financial institutions, including Comerica, to engage in certain activities. Comerica's competitors may be subject to a significantly different or reduced degree of regulation due to their asset size or types of products offered. They may also have the ability to more efficiently utilize resources to comply with regulations or may be able to more effectively absorb the costs of regulations into their existing cost structure. If Comerica is unable to compete effectively in products and pricing in its markets, business could decline, which could have a material adverse effect on Comerica's business, financial condition or results of operations. Changes in customer behavior may adversely impact Comerica's business, financial condition and results of operations. Comerica uses a variety of financial tools, models and other methods to anticipate customer behavior as a part of its strategic planning and to meet certain regulatory requirements. Individual, economic, political, industry-specific conditions and other factors outside of Comerica's control, such as fuel prices, energy costs, real estate values or other factors that affect customer income levels, could alter predicted customer borrowing, repayment, investment and deposit practices. Such a change in these practices could materially adversely affect Comerica's ability to anticipate business needs and meet regulatory requirements. Further, difficult economic conditions may negatively affect consumer confidence levels. A decrease in consumer confidence levels would likely aggravate the adverse effects of these difficult market conditions on Comerica, Comerica's customers and others in the financial institutions industry. Any future strategic acquisitions or divestitures may present certain risks to Comerica's business and operations. Difficulties in capitalizing on the opportunities presented by a future acquisition may prevent Comerica from fully achieving the expected benefits from the acquisition, or may cause the achievement of such expectations to take longer to realize than expected. will be subject to similar risks and difficulties in connection with any future decisions to downsize, sell or close units or otherwise change the business mix of Comerica. Management's ability to maintain and expand customer relationships may differ from expectations. The financial services industry is very competitive. Comerica not only vies for business opportunities with new customers, but also competes to maintain and expand the relationships it has with its existing customers. While management believes that it can continue to grow many of these relationships, Comerica will continue to experience pressures to maintain these relationships as its competitors attempt to capture its customers. Failure to create new customer relationships and to maintain and expand existing customer relationships to the extent anticipated may adversely impact Comerica's earnings. Management's ability to retain key officers and employees may change. Comerica's future operating results depend substantially upon the continued service of its executive officers and key personnel. Comerica's future operating results also depend in significant part upon its ability to attract and retain qualified management, financial, technical, marketing, sales and support personnel. Competition for qualified personnel is intense, and Comerica cannot ensure success in attracting or retaining qualified personnel. There may be only a limited number of persons with the requisite skills to serve in these positions, and it may be increasingly difficult for Comerica to hire personnel over time. Further, Comerica's ability to retain key officers and employees may be impacted by legislation and regulation affecting the financial services industry. On April 14, 2011, FRB, OCC and several other federal financial regulators issued a joint proposed rulemaking to implement Section 956 of the Dodd-Frank Act. Section 956 requires the regulators to issue regulations that prohibit incentive-based compensation arrangements that encourage inappropriate risk taking by covered financial institutions and are deemed to be excessive, or that may lead to material losses. Consistent with the Dodd-Frank Act, the proposed rule would not apply to institutions with total consolidated assets of less than $1 billion, and would impose heightened standards for institutions with $50 billion or more in total consolidated assets, which includes Comerica. For these larger institutions, the proposed rule would require that at least 50 percent of incentive-based payments be deferred over a minimum period of three years for designated executives. Moreover, boards of directors of these larger institutions would be required to identify employees who have the ability to expose the institution to possible losses that are substantial in relation to the institution's size, capital or overall risk tolerance, and to determine that the incentive compensation for these employees appropriately balances risk and rewards according to enumerated standards. Accordingly, Comerica may be at a disadvantage to offer competitive compensation compared to other financial institutions (as referenced above) or companies in other industries, which may not be subject to the same requirements. Comerica's business, financial condition or results of operations could be materially adversely affected by the loss of any of its key employees, or Comerica's inability to attract and retain skilled employees. Legal and regulatory proceedings and related matters with respect to the financial services industry, including those directly involving Comerica and its subsidiaries, could adversely affect Comerica or the financial services industry in general. Comerica has been, and may in the future be, subject to various legal and regulatory proceedings. It is inherently difficult to assess the outcome of these matters, and there can be no assurance that Comerica will prevail in any proceeding or litigation. Any such matter could result in substantial cost and diversion of Comerica's efforts, which by itself could have a material adverse effect on Comerica's financial condition and operating results. Further, adverse determinations in such matters could result in actions by Comerica's regulators that could materially adversely affect Comerica's business, financial condition or results of operations. Comerica establishes reserves for legal claims when payments associated with the claims become probable and the costs can be reasonably estimated. Comerica may still incur legal costs for a matter even if it has not established a reserve. In addition, due to the inherent subjectivity of the assessments and unpredictability of the outcome of legal proceedings, the actual cost of resolving a legal claim may be substantially higher than any amounts reserved for that matter. The ultimate resolution of a pending legal proceeding, depending on the remedy sought and granted, could adversely affect Comerica's results of operations and financial condition. Methods of reducing risk exposures might not be effective. Instruments, systems and strategies used to hedge or otherwise manage exposure to various types of credit, market, liquidity, operational, compliance and strategic risks could be less effective than anticipated. As a result, Comerica may not be able to effectively mitigate its risk exposures in particular market environments or against particular types of risk, which could have a material adverse impact on Comerica's business, financial condition or results of operations. Terrorist activities or other hostilities may adversely affect the general economy, financial and capital markets, specific industries, and Comerica. Terrorist attacks or other hostilities may disrupt Comerica's operations or those of its customers. In addition, these events have had and may continue to have an adverse impact on the U.S. and world economy in general and consumer confidence and spending in particular, which could harm Comerica's operations. Any of these events could increase volatility in the U.S. and world financial markets, which could harm Comerica's stock price and may limit the capital resources available to Comerica and its customers. This could have a material adverse impact on Comerica's operating results, revenues and costs and may result in increased volatility in the market price of Comerica's common stock. Catastrophic events, including, but not limited to, hurricanes, tornadoes, earthquakes, fires, droughts and floods, may adversely affect the general economy, financial and capital markets, specific industries, and Comerica. Comerica has significant operations and a significant customer base in California, Texas, Florida and other regions where natural and other disasters may occur. These regions are known for being vulnerable to natural disasters and other risks, such as tornadoes, hurricanes, earthquakes, fires, droughts and floods. These types of natural catastrophic events at times have disrupted the local economy, Comerica's business and customers and have posed physical risks to Comerica's property. In addition, catastrophic events occurring in other regions of the world may have an impact on Comerica's customers and in turn, on Comerica. A significant catastrophic event could materially adversely affect Comerica's operating results. Changes in accounting standards could materially impact Comerica's financial statements. From time to time accounting standards setters change the financial accounting and reporting standards that govern the preparation of Comerica's financial statements. These changes can be difficult to predict and can materially impact how Comerica records and reports its financial condition and results of operations. In some cases, Comerica could be required to apply a new or revised standard retroactively, resulting in changes to previously reported financial results, or a cumulative charge to retained earnings. Comerica's accounting policies and processes are critical to the reporting of financial condition and results of operations. They require management to make estimates about matters that are uncertain. Accounting policies and processes are fundamental to how Comerica records and reports the financial condition and results of operations. Management must exercise judgment in selecting and applying many of these accounting policies and processes so they comply with U.S. GAAP. In some cases, management must select the accounting policy or method to apply from two or more alternatives, any of which may be reasonable under the circumstances, yet may result in the Company reporting materially different results than would have been reported under a different alternative. Management has identified certain accounting policies as being critical because they require management's judgment to make difficult, subjective or complex judgments about matters that are uncertain. Materially different amounts could be reported under different conditions or using different assumptions or estimates. Comerica has established detailed policies and control procedures that are intended to ensure these critical accounting estimates and judgments are well controlled and applied consistently. In addition, the policies and procedures are intended to ensure that the process for changing methodologies occurs in an appropriate manner. Because of the uncertainty surrounding management's judgments and the estimates pertaining to these matters, Comerica cannot guarantee that it will not be required to adjust accounting policies or restate prior period financial statements. See “Critical Accounting Policies” on pages F-37 through F-40 of the Financial Section of this report and Note 1 of the Notes to Consolidated Financial Statements located on pages F-48 through F-61 of the Financial Section of this report. The executive offices of Comerica are located in the Comerica Bank Tower, 1717 Main Street, Dallas, Texas 75201. Comerica Bank occupies five floors of the building, plus additional space on the building's lower level. Comerica leased an additional floor of the building, totaling 25,135 sq. feet, in December 2014, which is anticipated to be occupied starting in April 2015. Comerica does not own the Comerica Bank Tower space, but has naming rights to the building and leases the space from an unaffiliated third party. The lease for such space used by Comerica and its subsidiaries extends through September 2023. Comerica's Michigan headquarters are located in a 10-story building in the central business district of Detroit, Michigan at 411 W. Lafayette, Detroit, Michigan 48226. Such building is owned by Comerica Bank. As of December 31, 2014, Comerica, through its banking affiliates, operated a total of 548 banking centers, trust services locations, and loan production or other financial services offices, primarily in the States of Texas, Michigan, California, Florida and Arizona. Of these offices, 235 were owned and 313 were leased. As of December 31, 2014, affiliates also operated from leased spaces in Denver, Colorado; Wilmington, Delaware; Oakbrook Terrace, Illinois; Boston and Waltham, Massachusetts; Minneapolis, Minnesota; Morristown, New Jersey; New York, New York; Rocky Mount and Cary, North Carolina; Granville, Ohio; Memphis, Tennessee; Reston, Virginia; Bellevue and Seattle, Washington; Monterrey, Mexico; Toronto, Ontario, Canada and Windsor, Ontario, Canada. Comerica and its subsidiaries own, among other properties, a check processing center in Livonia, Michigan, and three buildings in Auburn Hills, Michigan, used mainly for lending functions and operations. Please see Note 21 of the Notes to Consolidated Financial Statements located on pages F-100 through F-101 of the Financial Section of this report. The common stock of Comerica Incorporated is traded on the New York Stock Exchange (NYSE Trading Symbol: CMA). At February 11, 2015, there were approximately 10,695 record holders of Comerica's common stock. Quarterly cash dividends were declared during 2014 and 2013 totaling $0.79 and $0.68 per common share per year, respectively. The following table sets forth, for the periods indicated, the high and low sale prices per share of Comerica's common stock as reported on the NYSE Composite Transactions Tape for all quarters of 2014 and 2013, as well as dividend information. * Dividend yield is calculated by annualizing the quarterly dividend per share and dividing by an average of the high and low price in the quarter. A discussion of dividend restrictions is set forth in Note 20 of the Notes to Consolidated Financial Statements located on pages F-99 through F-100 of the Financial Section of this report and in the “Supervision and Regulation” section of this report. Our performance graph is available under the caption "Performance Graph" on page F-2 of the Financial Section of this report. On April 22, 2014, the Board of Directors of Comerica authorized the repurchase of up to an additional 2.0 million shares of Comerica Incorporated outstanding common stock, in addition to the 5.1 million shares remaining at March 31, 2014 under the Board's prior authorizations for the share repurchase program initially approved in November 2010. Including the April 22, 2014 authorization, a total of 30.3 million shares has been authorized for repurchase under the share repurchase program since its inception in 2010. In November 2010, the Board authorized the purchase of up to all 11.5 million of Comerica's original outstanding warrants. There is no expiration date for Comerica's share repurchase program. The following table summarizes Comerica's share repurchase activity for the year ended December 31, 2014. Maximum number of shares and warrants that may yet be purchased under the publicly announced plans or programs. Includes approximately 239,000 shares (including 19,000 shares in the quarter ended December 31, 2014) purchased pursuant to deferred compensation plans and shares purchased from employees to pay for required minimum tax withholding related to restricted stock vesting under the terms of an employee share-based compensation plan during the year ended December 31, 2014. These transactions are not considered part of Comerica's repurchase program. Comerica made no repurchases of warrants under the repurchase program during the year ended December 31, 2014. Upon exercise of a warrant, the number of shares with a value equal to the aggregate exercise price is withheld from an exercising warrant holder as payment (known as a "net exercise provision"). During the year ended December 31, 2014, Comerica withheld the equivalent of approximately 491,000 shares to cover an aggregate of $25.1 million in exercise price and issued approximately 361,000 shares to the exercising warrant holders. Shares withheld in connection with the net exercise provision are not included in the total number of shares or warrants purchased in the above table. Includes April 22, 2014 share repurchase authorization for up to an additional 2.0 million shares. Reference is made to the caption “Selected Financial Data” on page F-3 of the Financial Section of this report. Reference is made to the sections entitled “2014 Overview and 2015 Outlook,” “Results of Operations," "Strategic Lines of Business," "Balance Sheet and Capital Funds Analysis," "Risk Management," "Critical Accounting Policies," "Supplemental Financial Data" and "Forward-Looking Statements" on pages F-4 through F-42 of the Financial Section of this report. Reference is made to the subheadings entitled “Market and Liquidity Risk,” “Operational Risk,” “Compliance Risk” and “Strategic Risk” on pages F-29 through F-36 of the Financial Section of this report. Reference is made to the sections entitled “Consolidated Balance Sheets,” “Consolidated Statements of Income,” “Consolidated Statements of Comprehensive Income,” “Consolidated Statements of Changes in Shareholders' Equity,” “Consolidated Statements of Cash Flows,” “Notes to Consolidated Financial Statements,” “Report of Management,” “Reports of Independent Registered Public Accounting Firm,” and “Historical Review” on pages F-43 through F-114 of the Financial Section of this report. As required by Rule 13a-15(b) of the Exchange Act, management, including the Chief Executive Officer and Chief Financial Officer, conducted an evaluation as of the end of the period covered by this Annual Report on Form 10-K, of the effectiveness of our disclosure controls and procedures as defined in Exchange Act Rule 13a-15(e). Based on that evaluation, the Chief Executive Officer and Chief Financial Officer concluded that Comerica's disclosure controls and procedures were effective as of the end of the period covered by this Annual Report on Form 10-K.
Management's annual report on internal control over financial reporting and the related attestation report of Comerica's registered public accounting firm are included on pages F-109 and F-110 in the Financial Section of this report. As required by Rule 13a-15(d) of the Exchange Act, management, including the Chief Executive Officer and Chief Financial Officer, conducted an evaluation of our internal control over financial reporting to determine whether any changes occurred during the period covered by this Annual Report on Form 10-K that have materially affected, or are reasonably likely to materially affect, Comerica's internal control over financial reporting. Based on that evaluation, the Chief Executive Officer and Chief Financial Officer concluded that there has been no such change during the last quarter of the fiscal year covered by this Annual Report on Form 10-K that has materially affected, or is reasonably likely to materially affect, Comerica's internal control over financial reporting. Comerica has a Senior Financial Officer Code of Ethics that applies to the Chief Executive Officer, the Chief Financial Officer, the Chief Accounting Officer and the Treasurer. The Senior Financial Officer Code of Ethics is available on Comerica's website at www.comerica.com. If any substantive amendments are made to the Senior Financial Officer Code of Ethics or if Comerica grants any waiver, including any implicit waiver, from a provision of the Senior Financial Officer Code of Ethics to the Chief Executive Officer, the Chief Financial Officer, the Chief Accounting Officer or the Treasurer, we will disclose the nature of such amendment or waiver on our website. The remainder of the response to this item will be included under the sections captioned “Information About Nominees,” “Committees and Meetings of Directors,” “Committee Assignments,” “Executive Officers” and “Section 16(a) Beneficial Ownership Reporting Compliance” of Comerica's definitive Proxy Statement relating to the Annual Meeting of Shareholders to be held on April 28, 2015, which sections are hereby incorporated by reference. The response to this item will be included under the sections captioned “Compensation Committee Interlocks and Insider Participation,” “Compensation Discussion and Analysis,” “Compensation of Directors,” “Governance, Compensation and Nominating Committee Report,” “2014 Summary Compensation Table,” “2014 Grants of Plan-Based Awards,” “Outstanding Equity Awards at Fiscal Year-End 2014,” “2014 Option Exercises and Stock Vested,” “Pension Benefits at Fiscal Year-End 2014,” “2014 Nonqualified Deferred Compensation,” and “Potential Payments upon Termination or Change of Control at Fiscal Year-End 2014” of Comerica's definitive Proxy Statement relating to the Annual Meeting of Shareholders to be held on April 28, 2015, which sections are hereby incorporated by reference. The response to this item will be included under the sections captioned “Security Ownership of Certain Beneficial Owners,” “Security Ownership of Management” and "Securities Authorized for Issuance Under Equity Compensation Plans" of Comerica's definitive Proxy Statement relating to the Annual Meeting of Shareholders to be held on April 28, 2015, which sections are hereby incorporated by reference. The response to this item will be included under the sections captioned “Director Independence and Transactions of Directors with Comerica,” “Transactions of Related Parties with Comerica,” and “Information about Nominees” of Comerica's definitive Proxy Statement relating to the Annual Meeting of Shareholders to be held on April 28, 2015, which sections are hereby incorporated by reference. The response to this item will be included under the section captioned “Independent Auditors” of Comerica's definitive Proxy Statement relating to the Annual Meeting of Shareholders to be held on April 28, 2015, which section is hereby incorporated by reference. Financial Statements: The financial statements that are filed as part of this report are included in the Financial Section on pages F-43 through F-111. All of the schedules for which provision is made in the applicable accounting regulations of the SEC are either not required under the related instruction, the required information is contained elsewhere in the Form 10-K, or the schedules are inapplicable and therefore have been omitted. Exhibits: The exhibits listed on the Exhibit Index on pages E-1 through E-5 of this Form 10-K are filed with this report or are incorporated herein by reference. 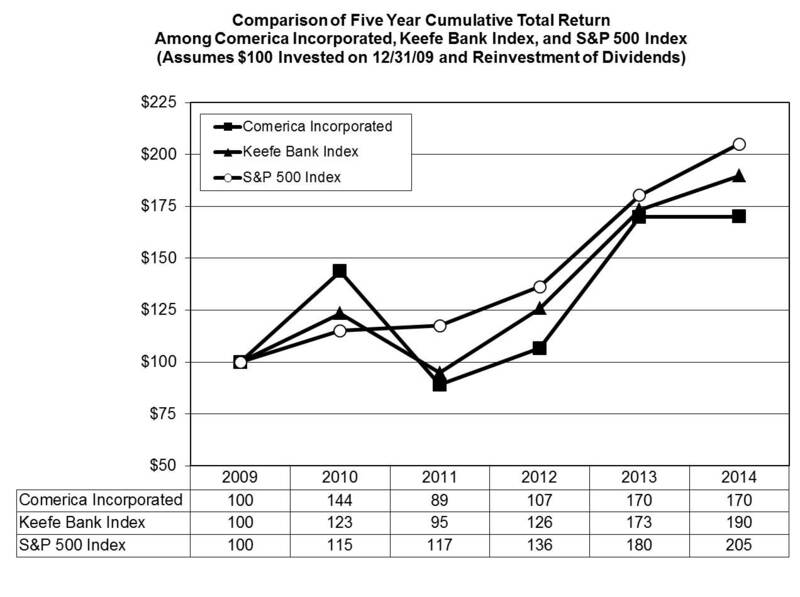 The graph shown below compares the total returns (assuming reinvestment of dividends) of Comerica Incorporated common stock, the S&P 500 Index, and the Keefe Bank Index. The graph assumes $100 invested in Comerica Incorporated common stock (returns based on stock prices per the NYSE) and each of the indices on December 31, 2009 and the reinvestment of all dividends during the periods presented. The performance shown on the graph is not necessarily indicative of future performance. See Supplemental Financial Data section for reconcilements of non-GAAP financial measures. Comerica Incorporated (the Corporation) is a financial holding company headquartered in Dallas, Texas. The Corporation's major business segments are the Business Bank, the Retail Bank and Wealth Management. The core businesses are tailored to each of the Corporation's three primary geographic markets: Michigan, California and Texas. Information about the activities of the Corporation's business segments is provided in Note 22 to the consolidated financial statements. As a financial institution, the Corporation's principal activity is lending to and accepting deposits from businesses and individuals. The primary source of revenue is net interest income, which is principally derived from the difference between interest earned on loans and investment securities and interest paid on deposits and other funding sources. The Corporation also provides other products and services that meet the financial needs of customers which generate noninterest income, the Corporation's secondary source of revenue. Growth in loans, deposits and noninterest income is affected by many factors, including economic conditions in the markets the Corporation serves, the financial requirements and economic health of customers, and the ability to add new customers and/or increase the number of products used by current customers. Success in providing products and services depends on the financial needs of customers and the types of products desired. The accounting and reporting policies of the Corporation and its subsidiaries conform to generally accepted accounting principles (GAAP) in the United States (U.S.). The Corporation's consolidated financial statements are prepared based on the application of accounting policies, the most significant of which are described in Note 1 to the consolidated financial statements. The most critical of these significant accounting policies are discussed in the “Critical Accounting Policies” section of this financial review. Net income was $593 million in 2014, an increase of $52 million, or 10 percent, compared to $541 million in 2013. Net income per diluted common share was $3.16 in 2014, compared to $2.85 in 2013. Excluding the impact to 2013 results of an unfavorable jury verdict in a lender liability case, which decreased 2013 net income by $28 million, or 15 cents per share, 2014 net income increased $24 million, or 4 percent, and earnings per diluted share increased 16 cents, or 5 percent. Average loans were $46.6 billion in 2014, an increase of $2.2 billion, or 5 percent, compared to 2013. The increase in average loans primarily reflected an increase of $1.7 billion, or 6 percent, in commercial loans, $158 million, or 10 percent, in residential mortgage loans and $117 million, or 5 percent, in consumer loans. The increase in commercial loans primarily reflected increases in Technology and Life Sciences, National Dealer Services, Energy and general Middle Market, partially offset by a decrease in Mortgage Banker Finance. Average deposits increased $3.1 billion, or 6 percent, to $54.8 billion in 2014, compared to 2013. The increase in average deposits reflected increases of $2.6 billion, or 12 percent, in average noninterest-bearing deposits and $1.2 billion, or 5 percent, in money market and interest-bearing checking deposits, partially offset by a decrease of $602 million, or 11 percent, in customer certificates of deposit. The increase in average deposits reflected increases in almost all lines of business and in all geographic markets. Net interest income was $1.7 billion in 2014, a decrease of $17 million, or 1 percent, compared to 2013. The decrease in net interest income resulted primarily from a $15 million decrease in the accretion of the purchase discount on the acquired loan portfolio. The benefit from an increase in average earning assets of $2.5 billion and lower funding costs was offset by continued pressure on yields from the low-rate environment and loan portfolio dynamics. The provision for credit losses decreased $19 million in 2014, compared to 2013, primarily due to continued improvements in credit quality. Improvements in credit quality included a decline of $367 million in the Corporation's criticized loan list from December 31, 2013 to December 31, 2014. The Corporation's criticized loan list is consistent with loans in the Special Mention, Substandard and Doubtful categories defined by regulatory authorities. Additional indicators of improved credit quality included a $48 million decrease in net credit-related charge-offs in 2014, compared to 2013. Noninterest income decreased $14 million or 2 percent, in 2014, compared to 2013, primarily the result of a $19 million decrease in noncustomer-driven income categories, with the largest decreases in deferred compensation asset returns, securities trading income and warrant income, partially offset by a $5 million increase in customer-driven fees, largely driven by increases in fiduciary income and card fees, partially offset by a decrease in letter of credit fees. Noninterest expenses decreased $96 million, or 6 percent, in 2014, compared to 2013, primarily reflecting decreases of $48 million in litigation-related expenses and $47 million in pension expense. The quarterly dividend was increased to 19 cents per common share in January 2014 and further increased to 20 cents per share in April 2014, increases of 12 percent and 5 percent, respectively. Shares repurchased under the share repurchase program totaled 5.2 million shares in 2014. Together with dividends of $0.79 per share, $392 million, or 66 percent of 2014 net income, was returned to shareholders. Average loan growth consistent with 2014, reflecting typical seasonality in Mortgage Banker Finance and National Dealer Services throughout the year and continued focus on pricing and structure discipline. Net interest income relatively stable, assuming no rise in interest rates, reflecting a decrease of about $30 million in purchase accounting accretion, to $4 million to $6 million, and the impact of a continuing low rate environment on asset yields, offset by earning asset growth. Provision for credit losses higher, consistent with modest net charge-offs and continued loan growth. Noninterest income relatively stable, reflecting growth in fee income, particularly card fees and fiduciary income, mostly offset by regulatory impacts on letter of credit, derivative and warrant income. Noninterest expenses higher, reflecting increases in technology, regulatory and pension expenses, as well as typical inflationary pressures, with continued focus on driving efficiencies for the long term. Technology and regulatory expenses are expected to increase approximately $40 million in total, compared to 2014. Income tax expense to approximate 33 percent of pretax income. The following provides a comparative discussion of the Corporation's consolidated results of operations for 2014 compared to 2013. A comparative discussion of results for 2013 compared to 2012 is provided at the end of this section. For a discussion of the Critical Accounting Policies that affect the Consolidated Results of Operations, see the "Critical Accounting Policies" section of this Financial Review. Accretion of the purchase discount on the acquired loan portfolio of $34 million, $49 million and $71 million increased the net interest margin by 6 basis points, 8 basis points and 12 basis points in 2014, 2013 and 2012, respectively. Nonaccrual loans are included in average balances reported and in the calculation of average rates. Includes investment securities available-for-sale and investment securities held-to-maturity. Average rate based on average historical cost. Carrying value exceeded average historical cost by $12 million, $92 million and $255 million in 2014, 2013 and 2012, respectively. Includes substantially all deposits by foreign depositors; deposits are primarily in excess of $100,000. Medium- and long-term debt average balances included $192 million, $274 million and $343 million in 2014, 2013 and 2012, respectively, for the gain attributed to the risk hedged with interest rate swaps. Interest expense on medium-and long-term debt was reduced by $72 million in both 2014 and 2013 and $69 million in 2012, for the net gains on these fair value hedge relationships. The FTE adjustment is computed using a federal tax rate of 35%. Rate/volume variances are allocated to variances due to volume. Reflected decreases of $15 million and $22 million in accretion of the purchase discount on the acquired loan portfolio in 2014 and 2013, respectively. Includes investment securities available-for-sale and investment securities held-to-maturity. Net interest income is the difference between interest and yield-related fees earned on assets and interest paid on liabilities. FTE adjustments are made to the yields on tax-exempt assets in order to present tax-exempt income and fully taxable income on a comparable basis. FTE adjustments totaled $4 million in 2014 and $3 million in both 2013 and 2012. Gains and losses related to the effective portion of risk management interest rate swaps that qualify as hedges are included with the interest expense of the hedged item. Net interest income on a FTE basis comprised 66 percent of total revenues in both 2014 and 2013, and 67 percent in 2012. The “Analysis of Net Interest Income-Fully Taxable Equivalent” table of this financial review provides an analysis of net interest income for the years ended December 31, 2014, 2013, and 2012. The rate-volume analysis in the table above details the components of the change in net interest income on a FTE basis for 2014 compared to 2013 and 2013 compared to 2012. Net interest income was $1.7 billion in 2014, a decrease of $17 million compared to 2013. The decrease in net interest income in 2014, compared to 2013, resulted primarily from a $15 million decrease in the accretion of the purchase discount on the acquired loan portfolio. The benefits from a $2.5 billion, or 4 percent, increase in average earning assets and lower funding costs were offset by lower loan yields. The increase in average earning assets primarily reflected increases of $2.2 billion in average loans and $583 million in average interest-bearing deposits with banks, partially offset by a decrease of $287 million in average investment securities. the FRB were $5.4 billion and $4.8 billion in 2014 and 2013, respectively, and are included in “interest-bearing deposits with banks” on the consolidated balance sheets. The Corporation utilizes various asset and liability management strategies to manage net interest income exposure to interest rate risk. Refer to the “Market and Liquidity Risk” section of this financial review for additional information regarding the Corporation's asset and liability management policies. The provision for credit losses was $27 million in 2014, compared to $46 million in 2013. The provision for credit losses includes both the provision for loan losses and the provision for credit losses on lending-related commitments. The provision for loan losses is recorded to maintain the allowance for loan losses at the level deemed appropriate by the Corporation to cover probable credit losses inherent in the portfolio. The provision for loan losses was $22 million in 2014, compared to $42 million in 2013. Credit quality in the loan portfolio continued to improve in 2014, compared to 2013. Improvements in credit quality included a decline of $367 million in the Corporation's criticized loan list from December 31, 2013 to December 31, 2014. Reflected in the decline in criticized loans was a decrease in nonaccrual loans of $77 million. The Corporation's criticized loan list is consistent with loans in the Special Mention, Substandard and Doubtful categories defined by regulatory authorities. Net loan charge-offs in 2014 decreased $48 million to $25 million, or 0.05 percent of average total loans, compared to $73 million, or 0.16 percent, in 2013. The $48 million decrease in net loan charge-offs in 2014, compared to 2013, reflected decreases in almost all business lines, with the largest decreases in Commercial Real Estate and general Middle Market, partially offset by an increase in Technology and Life Sciences. The provision for credit losses on lending-related commitments is recorded to maintain the allowance for credit losses on lending-related commitments at the level deemed appropriate by the Corporation to cover probable credit losses inherent in lending-related commitments. The provision for credit losses on lending-related commitments was $5 million in 2014, compared to $4 million in 2013. Lending-related commitment charge-offs were insignificant in 2014 and 2013. For further discussion of the allowance for loan losses and the allowance for credit losses on lending-related commitments, including the methodology used in the determination of the allowances and an analysis of the changes in the allowances, refer to Note 1 to the consolidated financial statements and the "Credit Risk" section of this financial review. The table below provides further details on certain categories included in other noninterest income. Noninterest income decreased $14 million to $868 million in 2014, compared to $882 million in 2013, reflecting a $19 million decrease in noncustomer-driven income categories, partially offset by a $5 million increase in customer-driven fees. An analysis of significant year over year changes by individual line item follows. Fiduciary income increased $9 million, or 6 percent, to $180 million in 2014, compared to $171 million in 2013. Personal and institutional trust fees are the two major components of fiduciary income. These fees are based on services provided and assets managed. Fluctuations in the market values of the underlying assets managed, which include both equity and fixed income securities, impact fiduciary income. The increase in 2014 was primarily due to an increase in personal trust fees, largely driven by an increase in the volume of fiduciary services sold in the professional trust alliance business and the favorable impact on fees of market value increases. Card fees, which consist primarily of interchange fees earned on debit cards and commercial cards, increased $6 million, or 8 percent, to $80 million in 2014, compared to $74 million in 2013. The increase in 2014 primarily reflected a volume-driven increase in commercial charge card interchange revenue. Letter of credit fees decreased $7 million, or 12 percent, to $57 million in 2014, compared to $64 million in 2013. The decrease in 2014 was primarily due to regulatory-driven decreases in the volume of letters of credit outstanding. Foreign exchange income increased $4 million, or 9 percent, to $40 million in 2014, compared to $36 million in 2013. The increase in 2014 was primarily due to an increase in customer-driven trading volume throughout the year. Other noninterest income decreased $26 million, or 15 percent, to $142 million in 2014, compared to $168 million in 2013, primarily reflecting decreases in deferred compensation plan asset returns, income recognized from the Corporation's third-party credit card provider, securities trading income and income from principal investing and warrants. The decrease in deferred compensation plan asset returns was offset by a decrease in deferred compensation expense in salaries and benefits expense. The decrease in income from the Corporation's third-party credit card provider was primarily the result of a change in the timing of the recognition of incentives from annually to quarterly in the third quarter 2013. The following table illustrates certain categories included in "other noninterest income" on the consolidated statements of income.